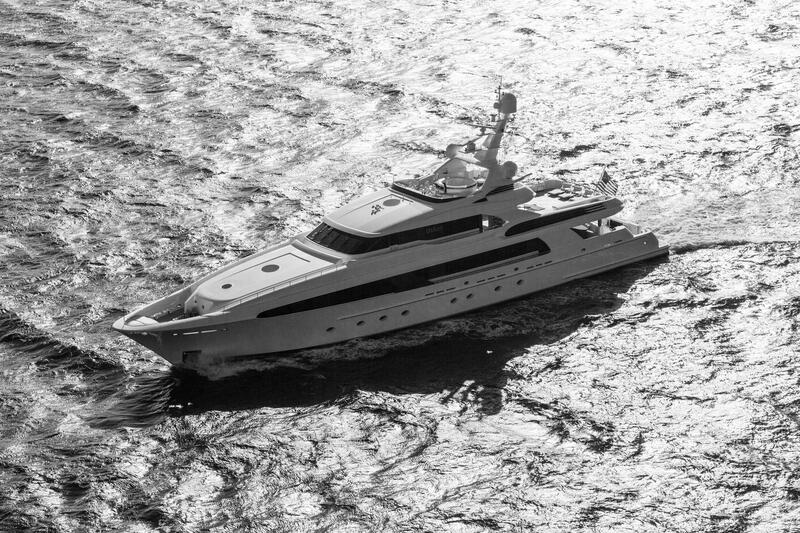 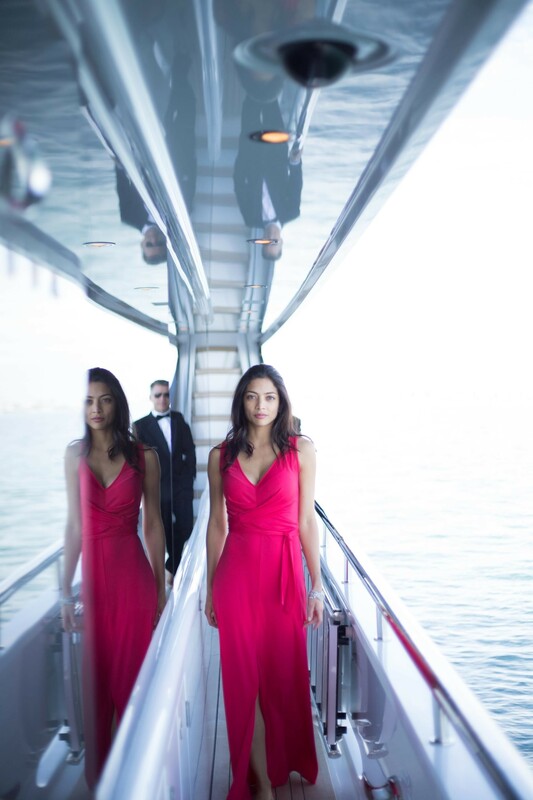 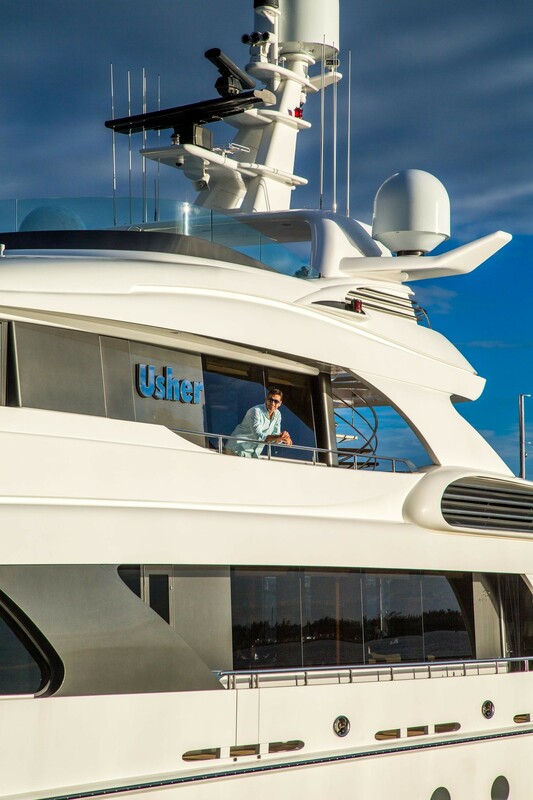 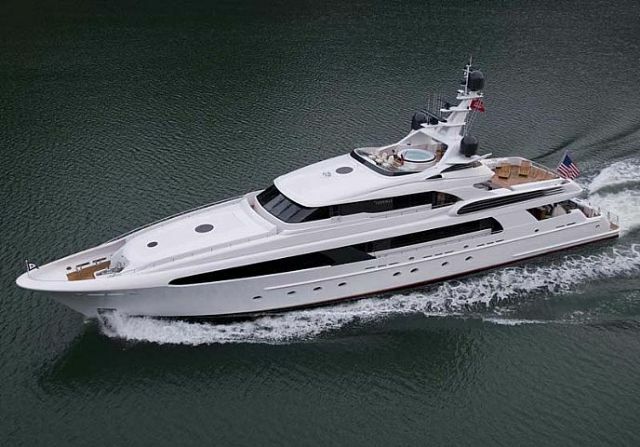 Superyacht USHER (ex MR. 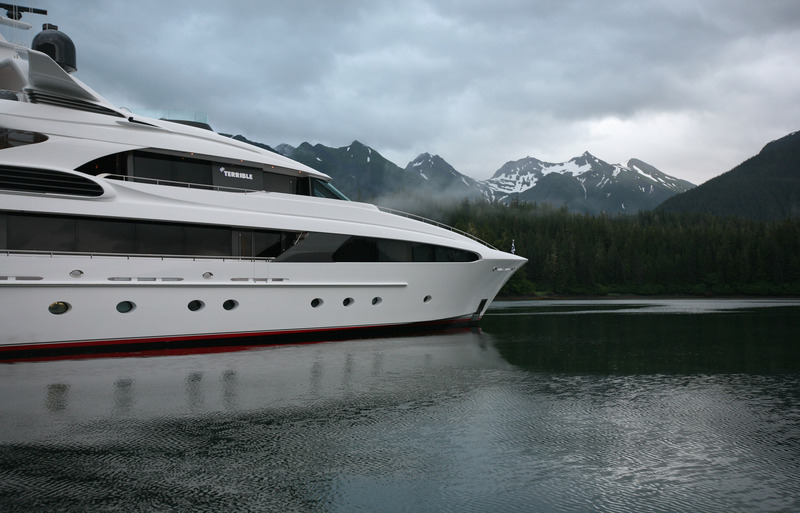 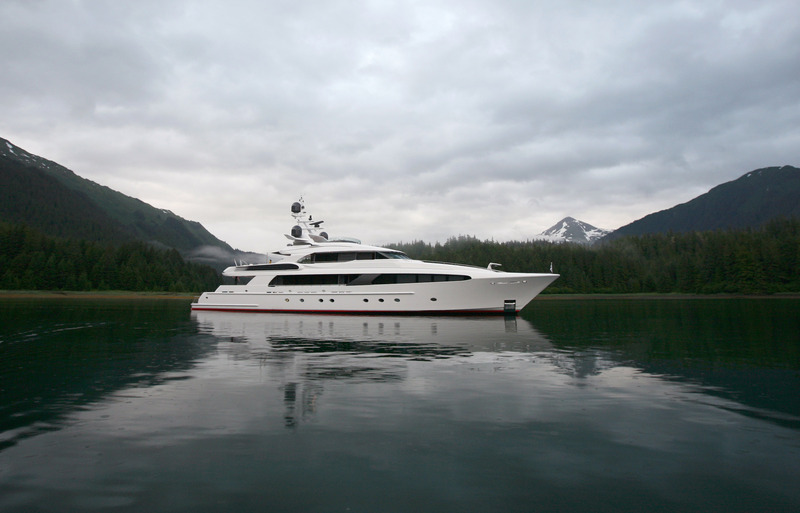 TERRIBLE) is a 46,94m (154' ) charter yacht built by the renown Delta Marine shipyard in 2007. 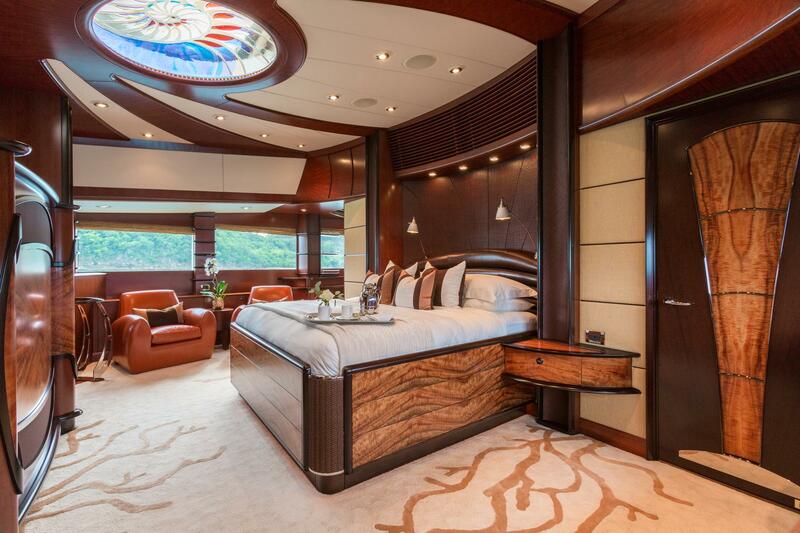 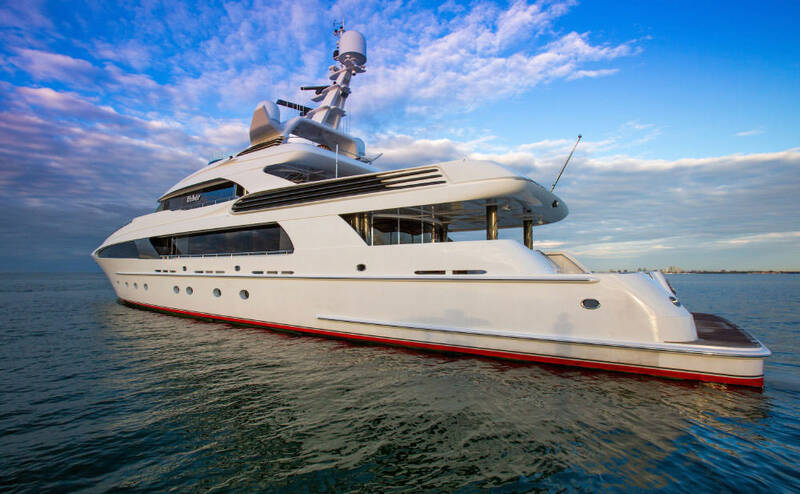 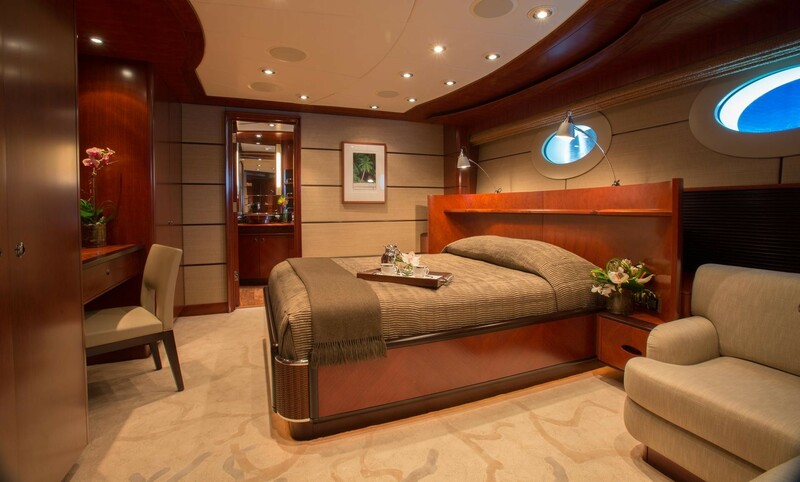 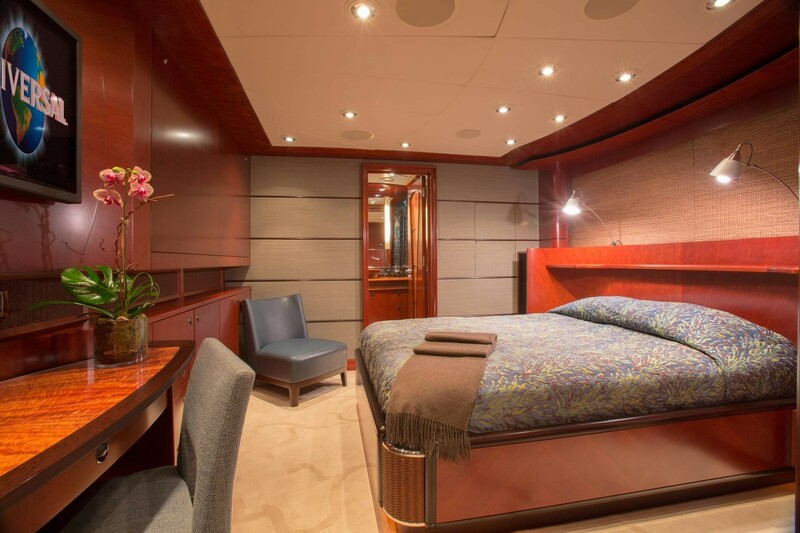 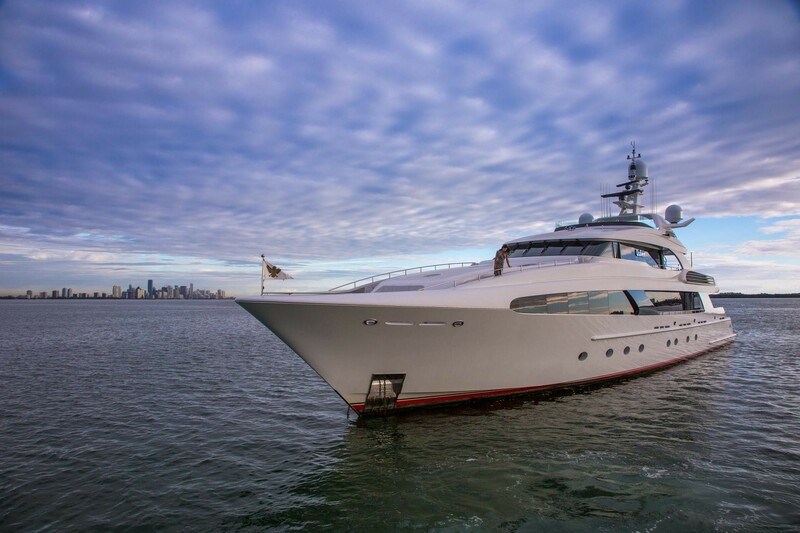 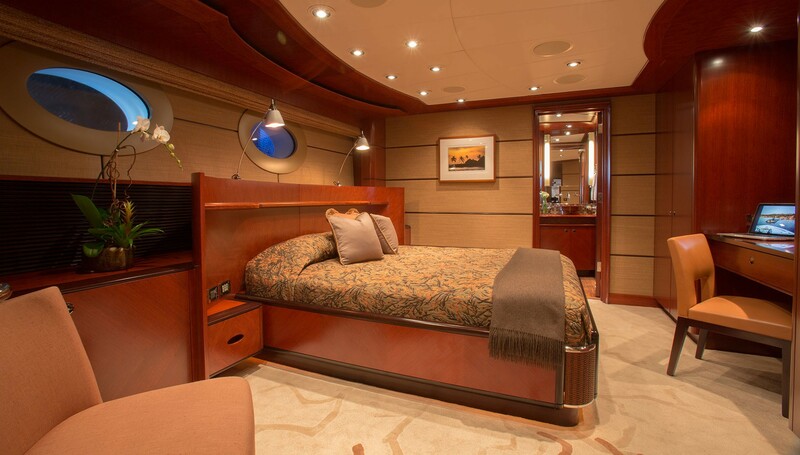 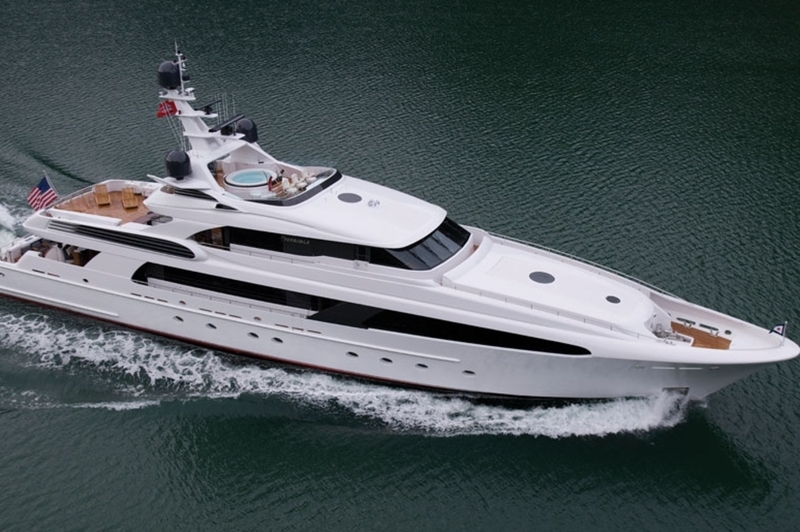 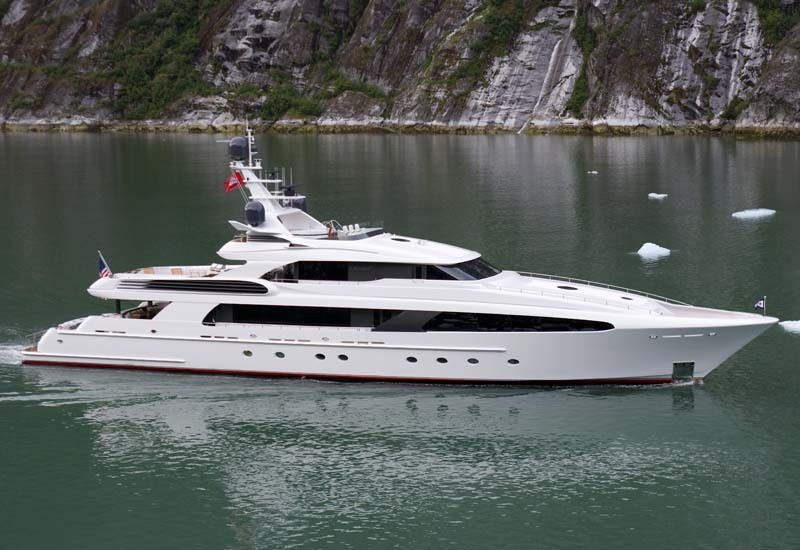 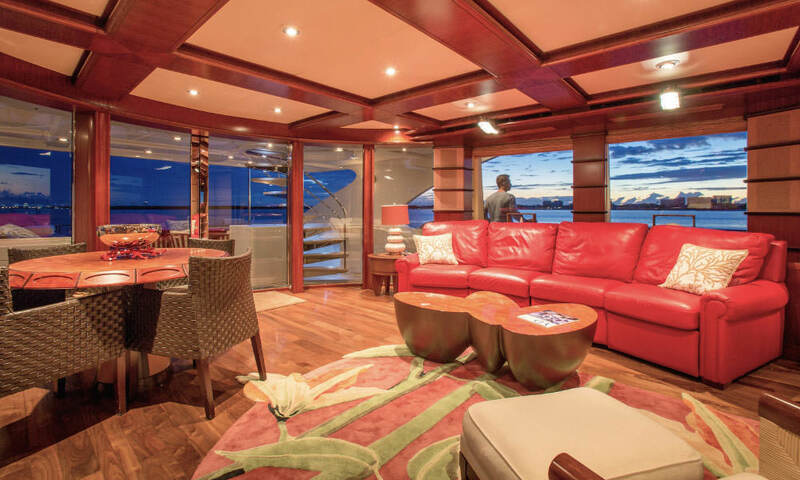 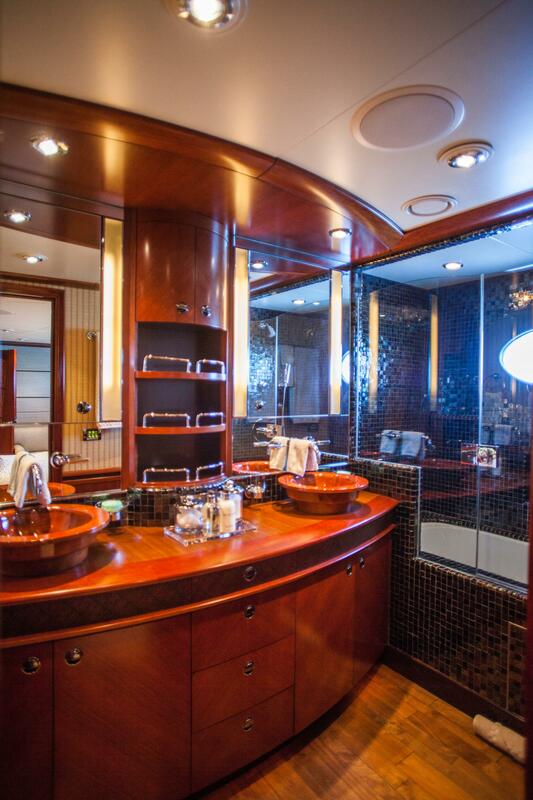 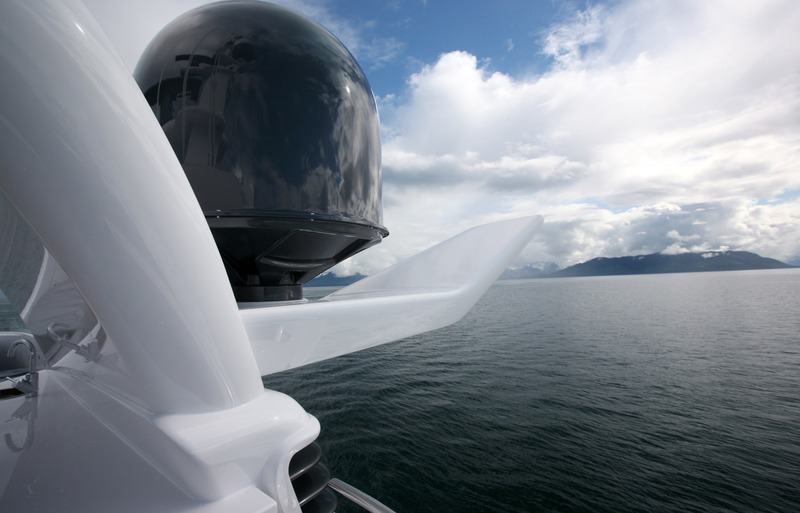 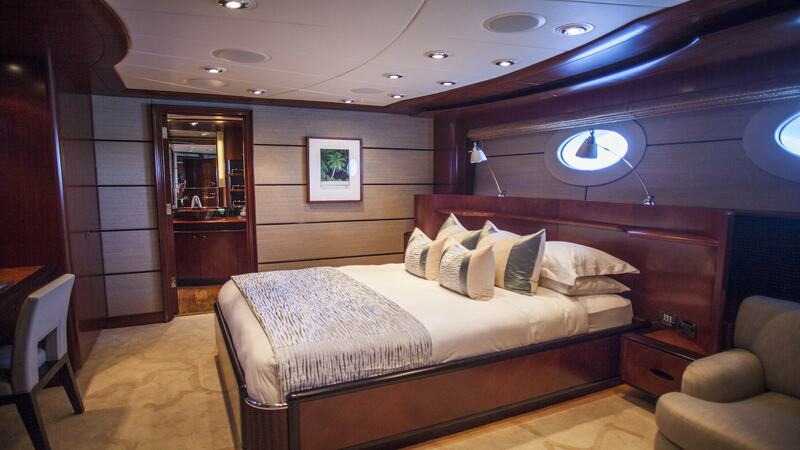 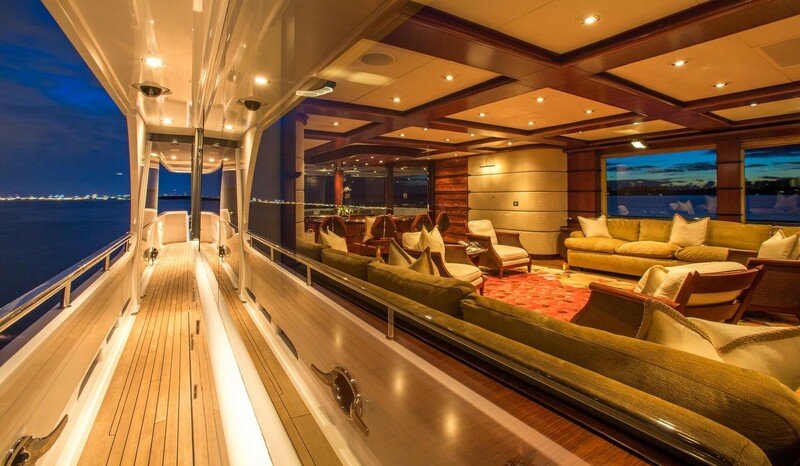 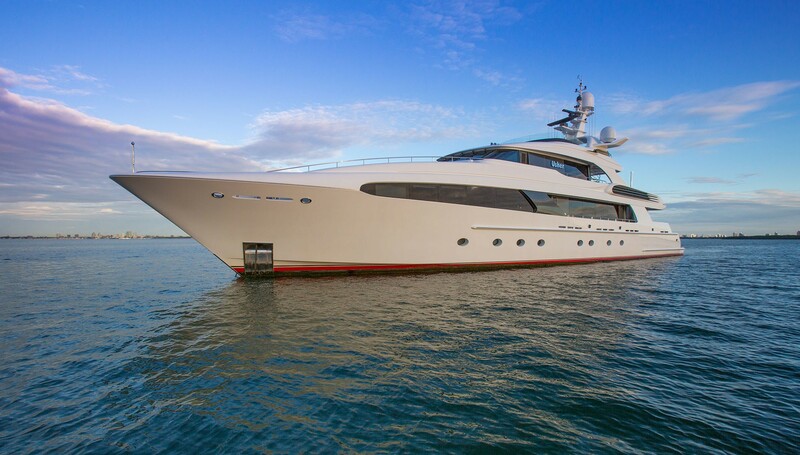 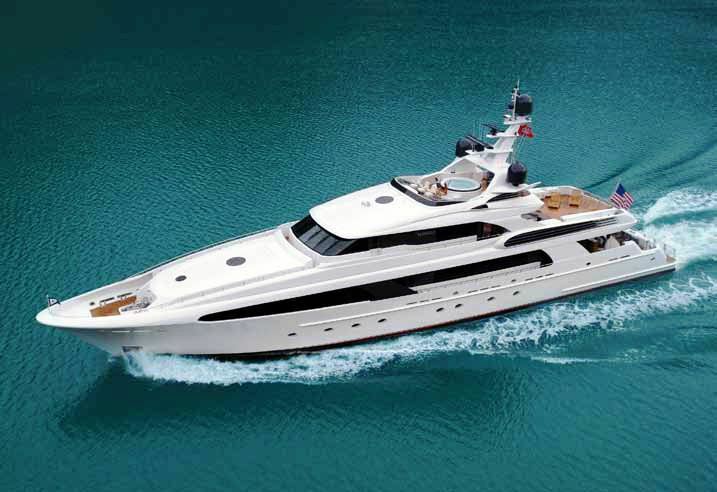 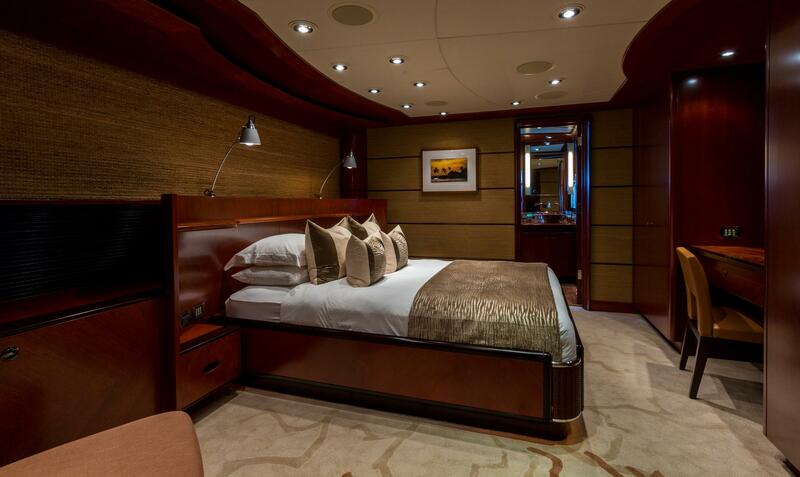 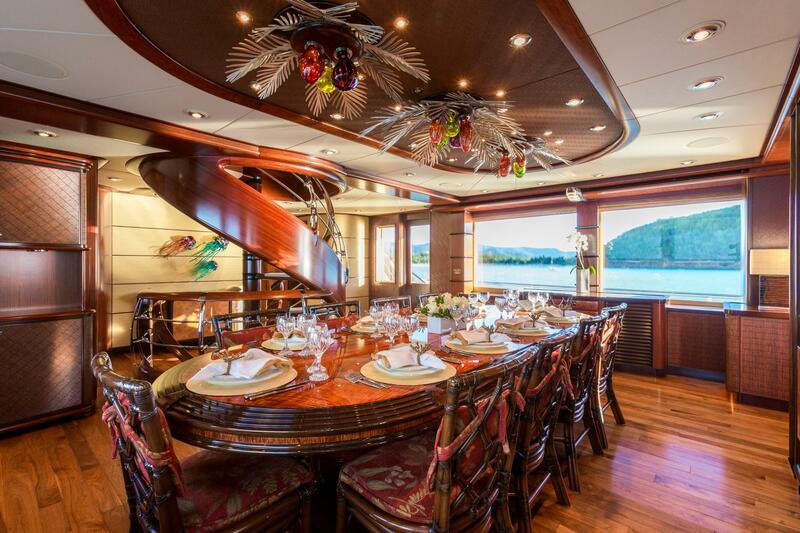 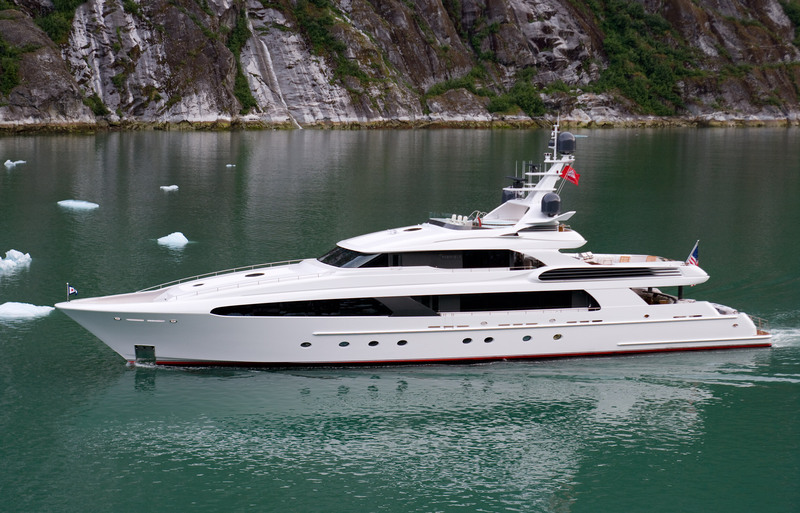 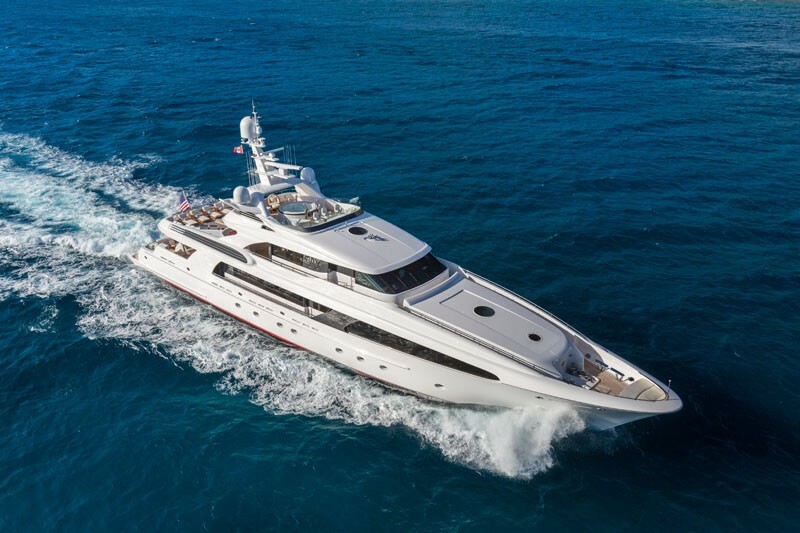 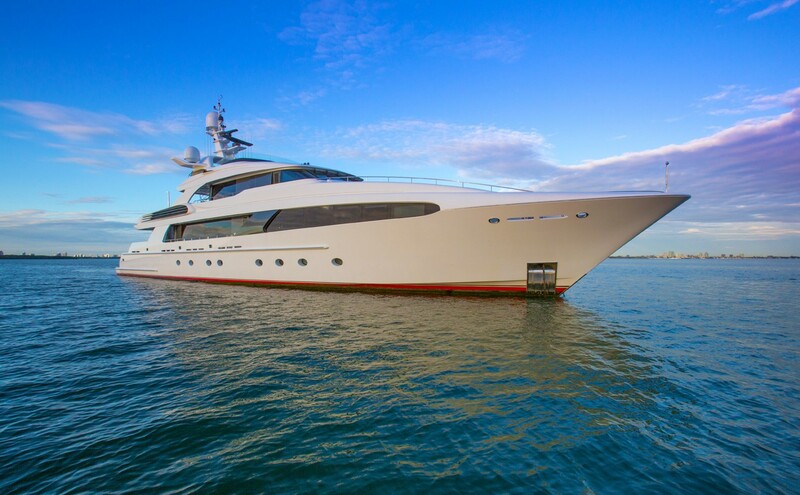 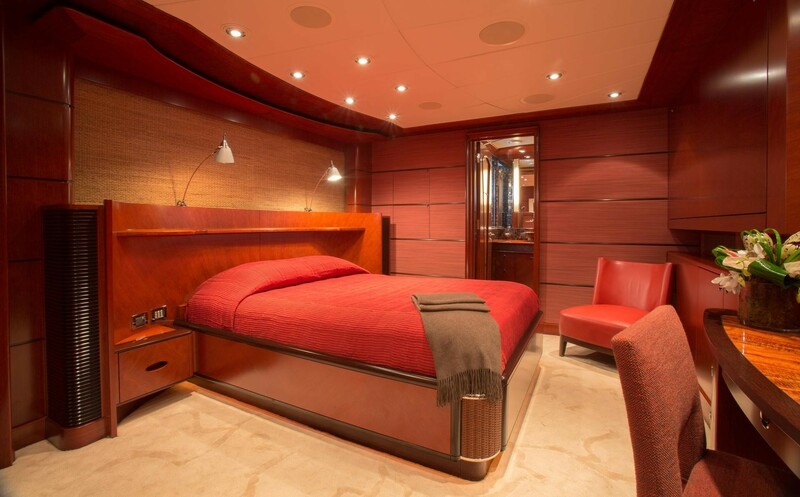 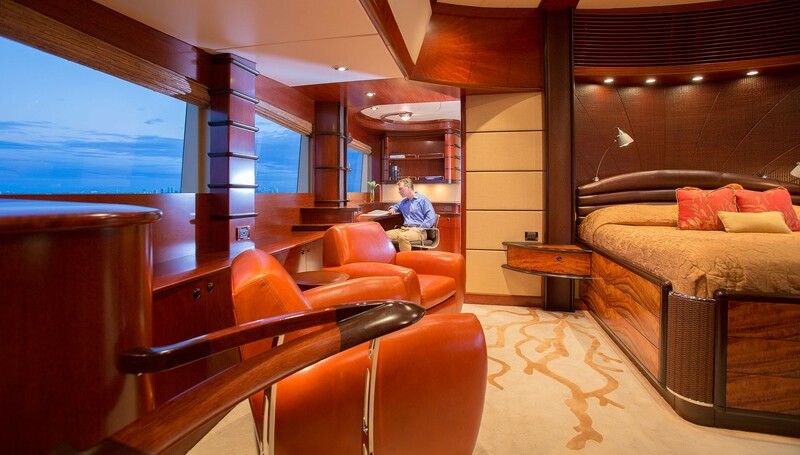 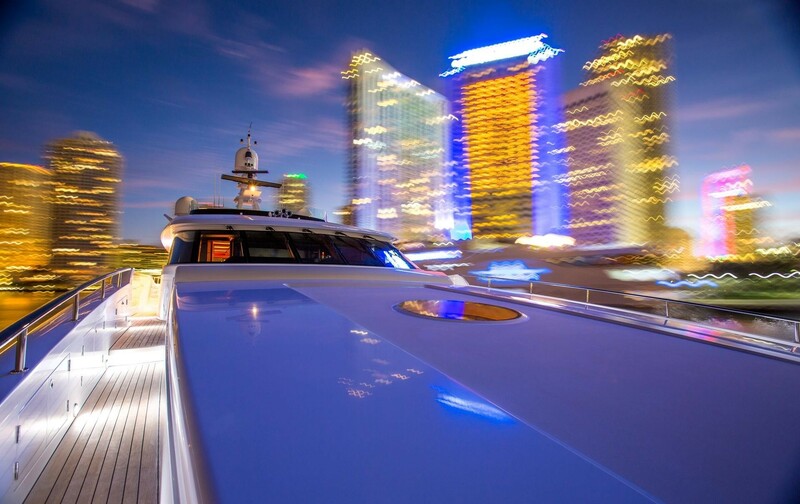 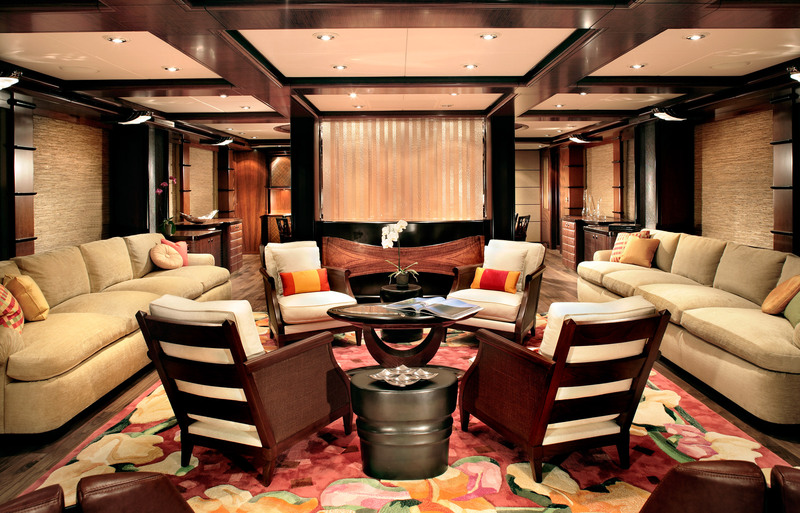 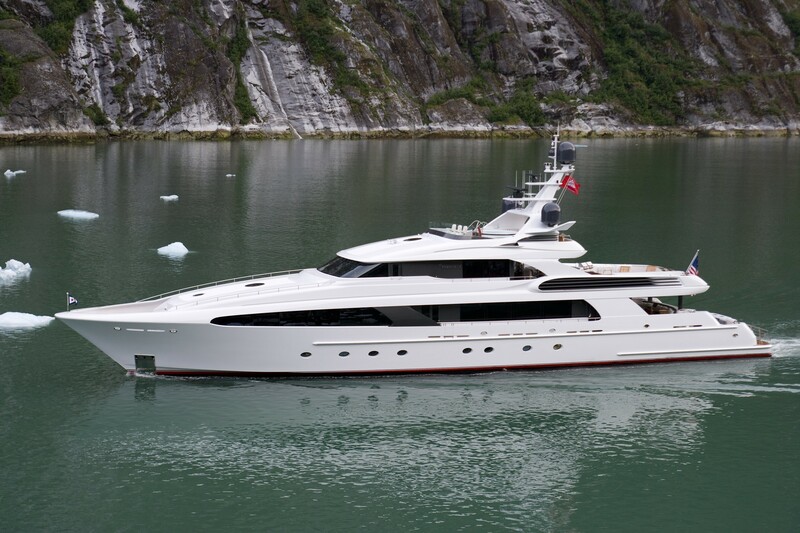 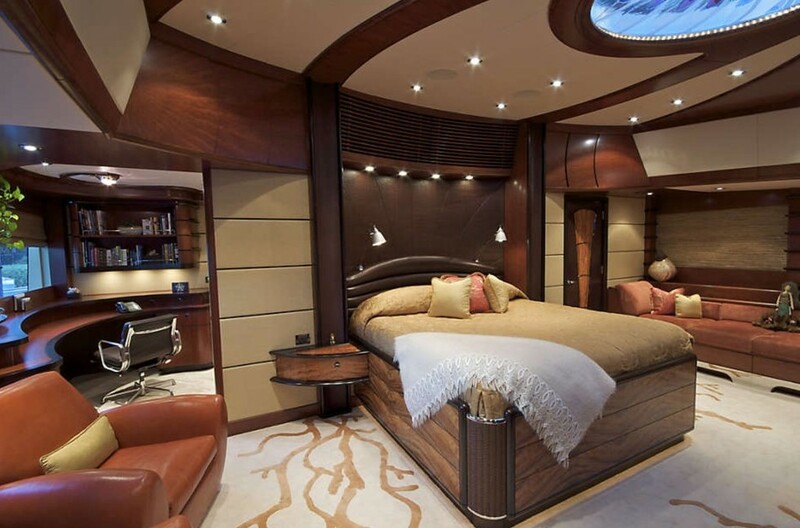 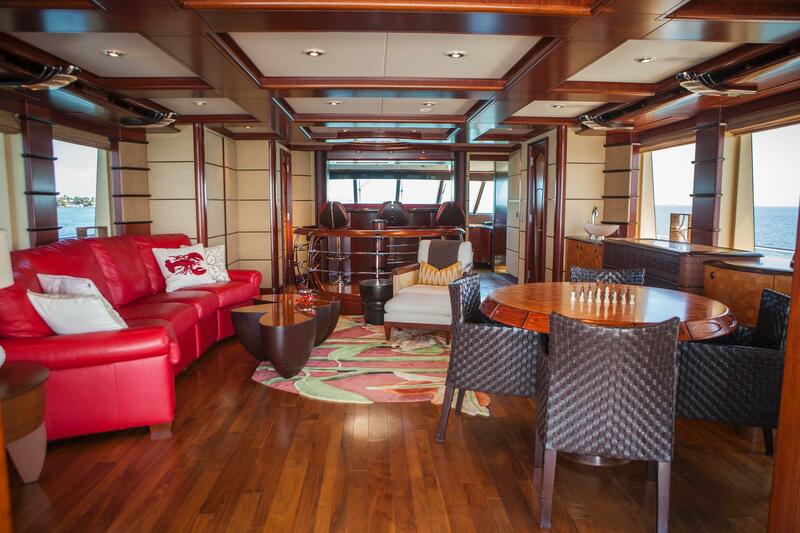 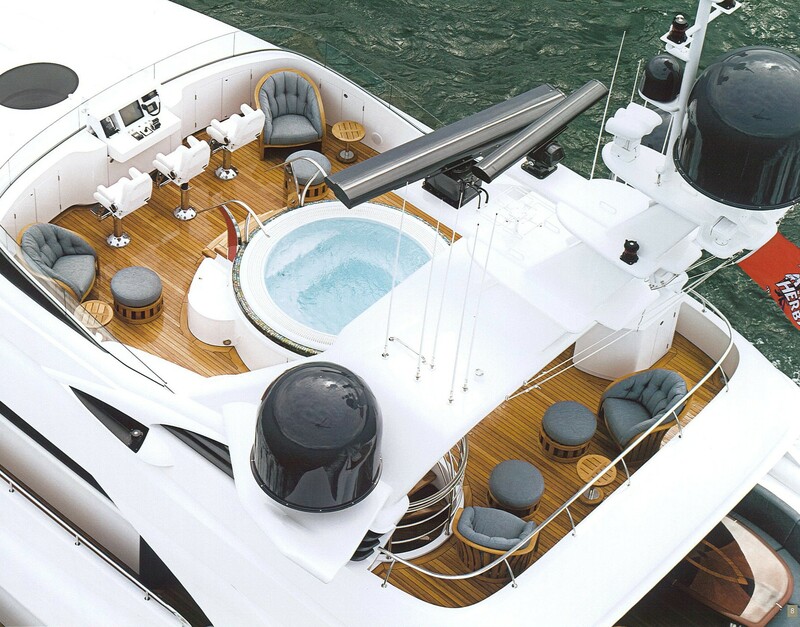 This motor yacht with contemporary styling and great performance can accommodate 12 charter guests in 5 cabins. 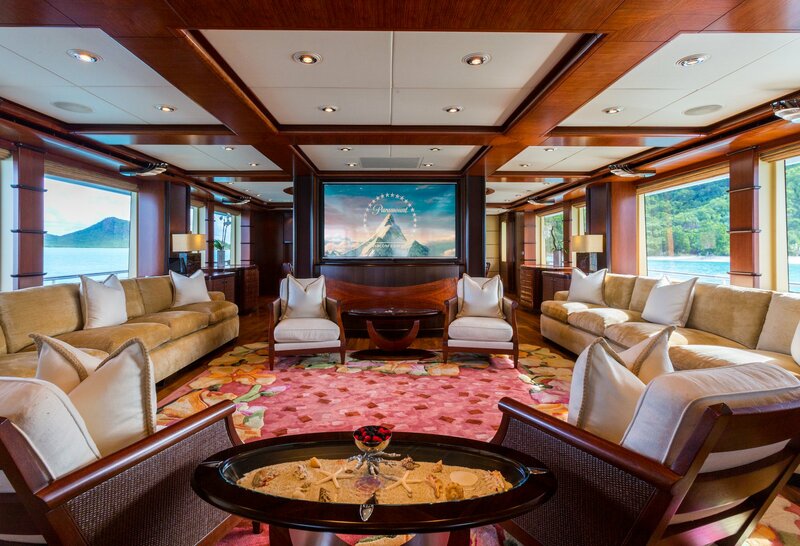 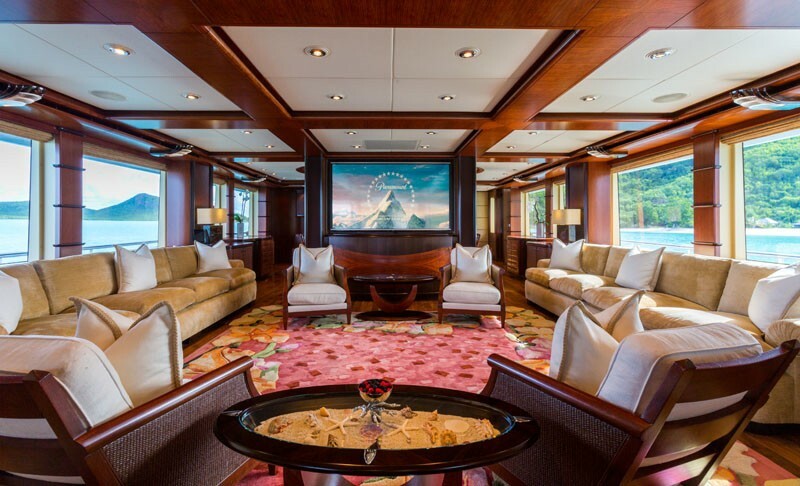 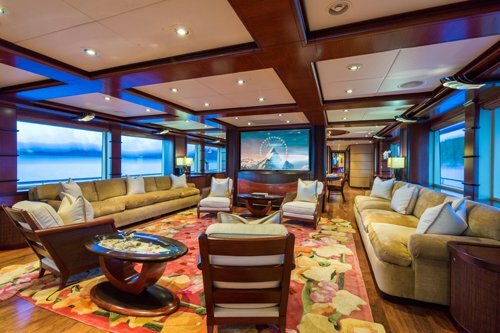 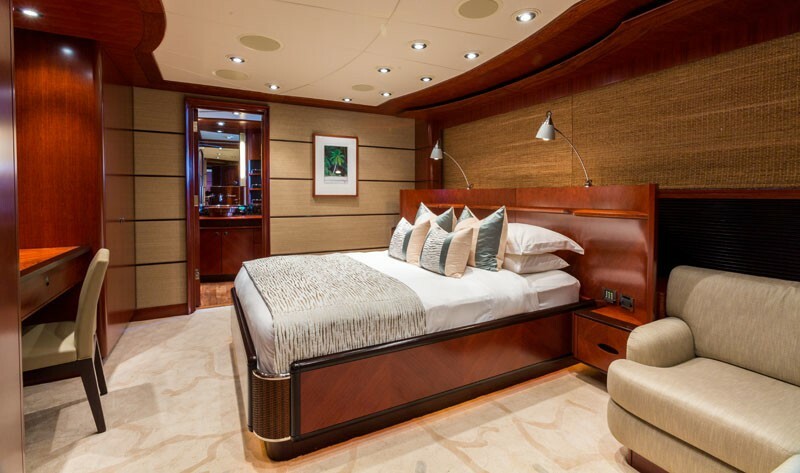 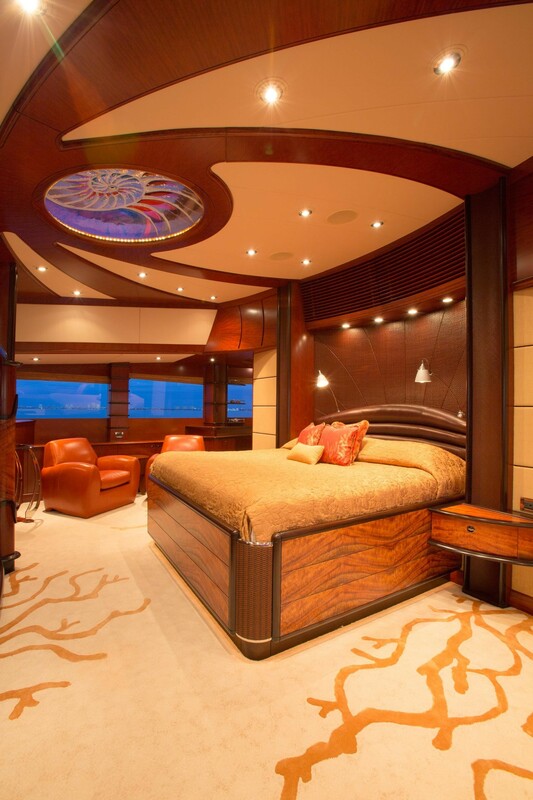 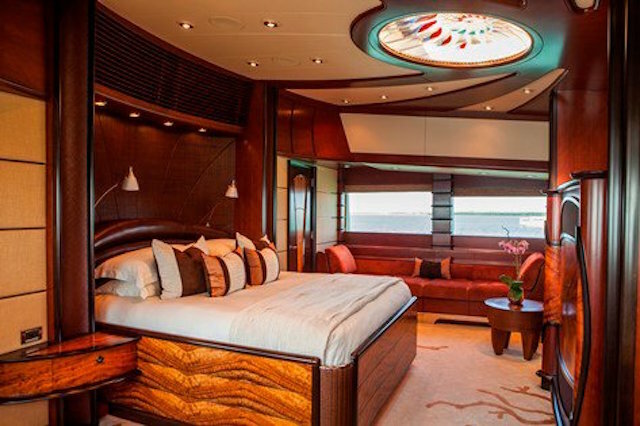 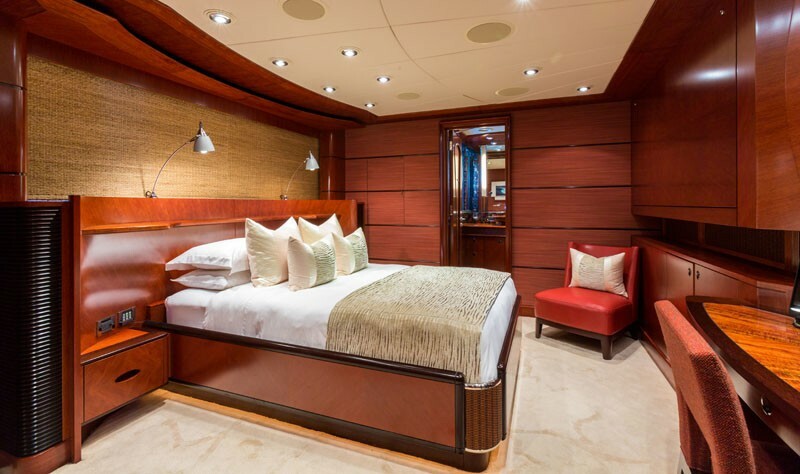 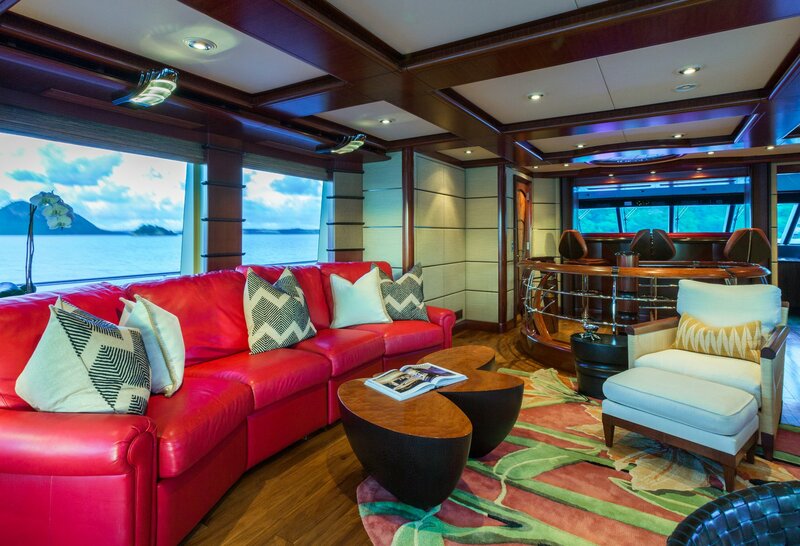 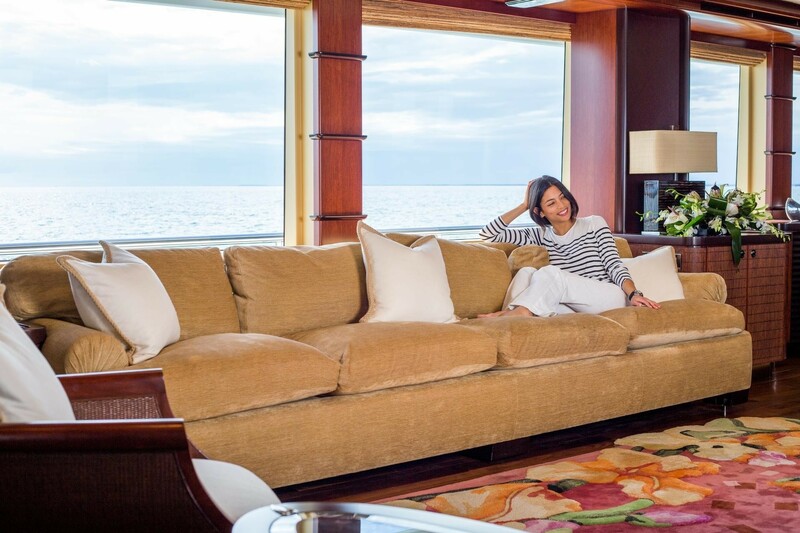 Luxury motor yacht USHER has a beautiful interior with inspired Polynesian styling invoking a sense of leisure, relaxation, and adventure. 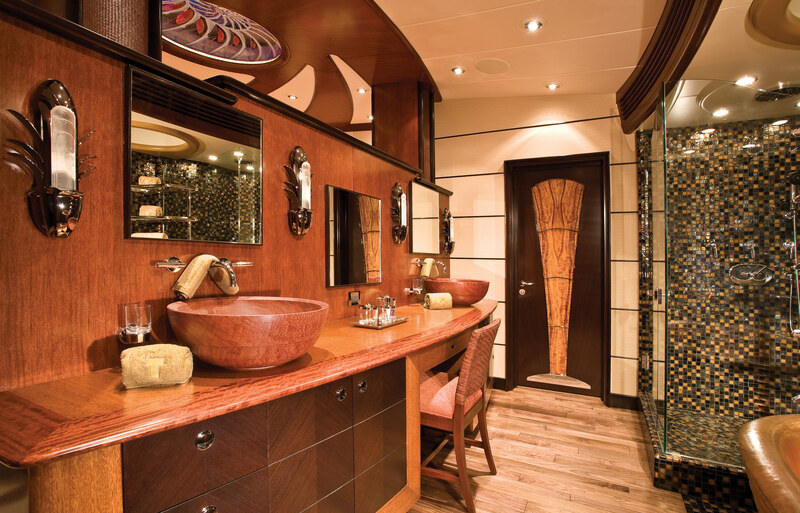 Her Polynesian artistry infused with elegant art deco touches is vibrant with tropical glasswork, rich exotic woods of wenge, bubinga, and Koa. 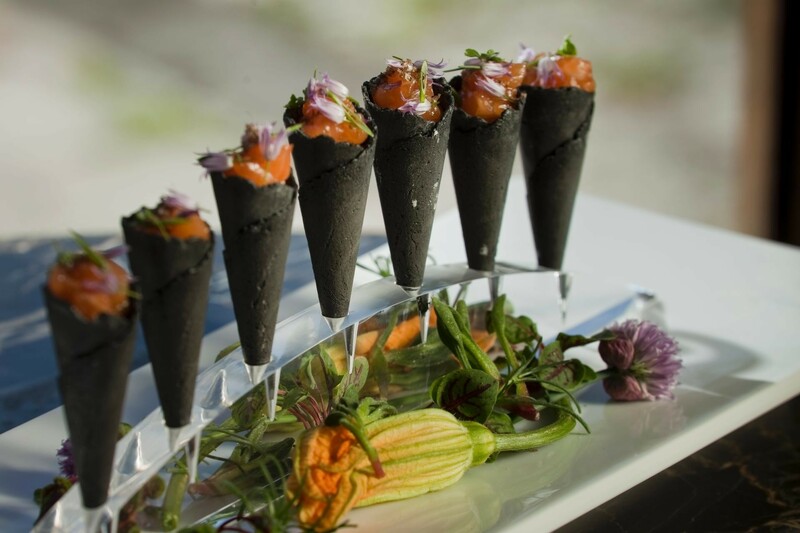 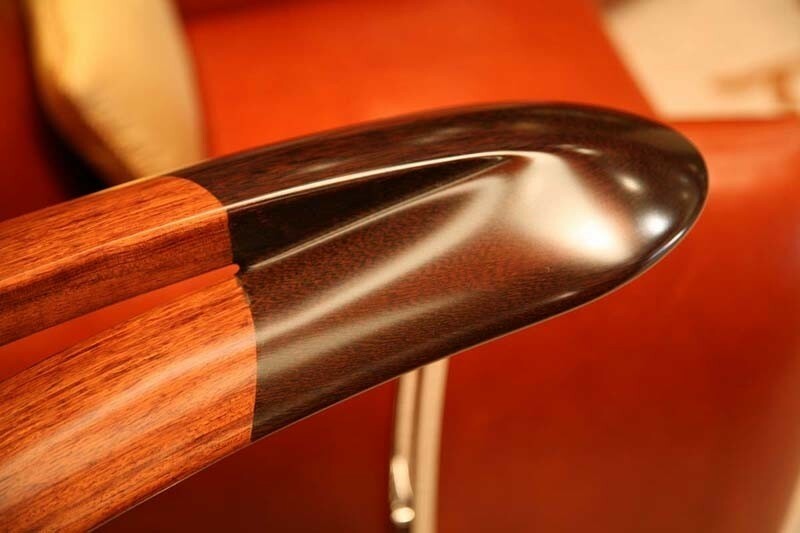 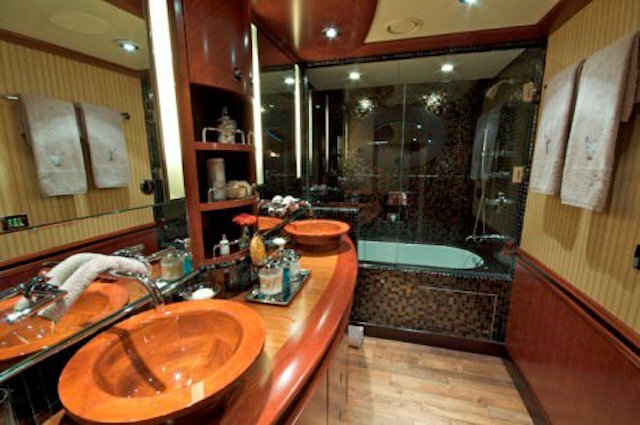 The overall effect is a harmonious contrast of modern and primitive styling. 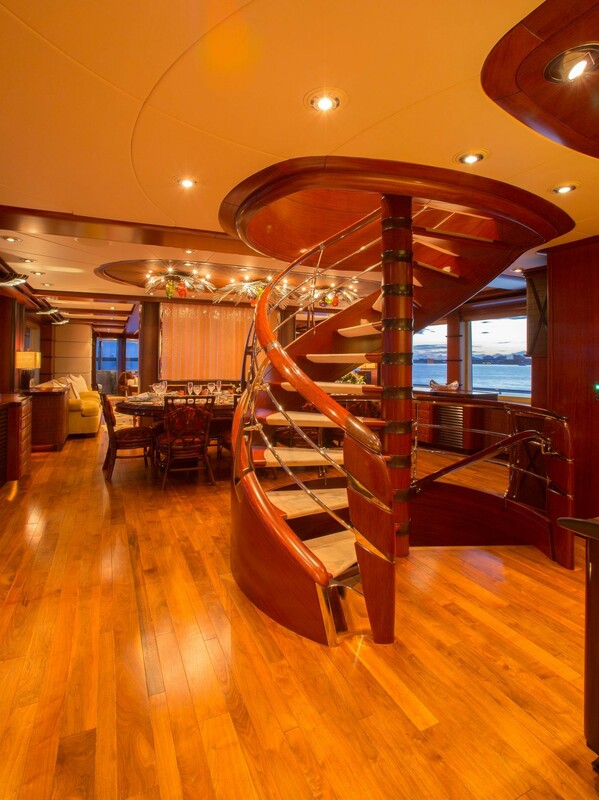 USHER's central staircase creates a dramatic focal point, crafted of bubinga and accented with wenge and stainless steel. 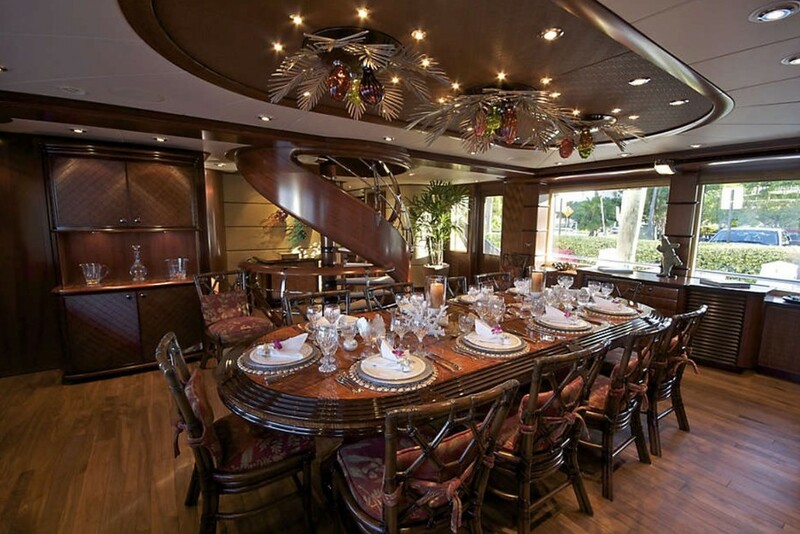 The dining salon, with room for 14 guests, is framed by a magnificent chandelier comprised of abstract botanical forms and brushed aluminum fronds. 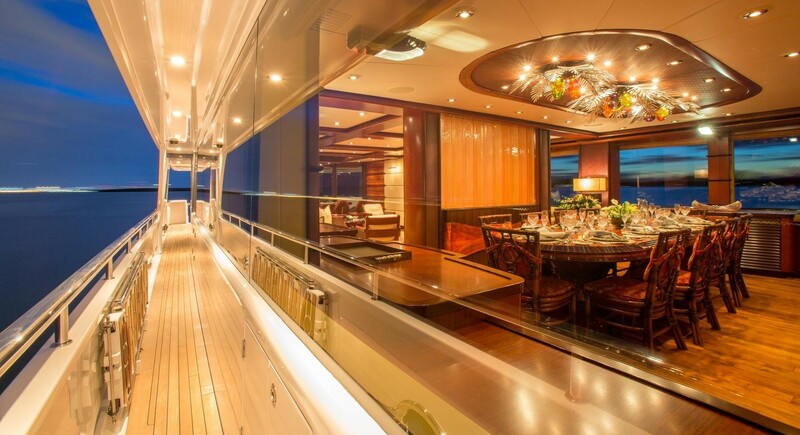 The interior layout is open, airy and light. 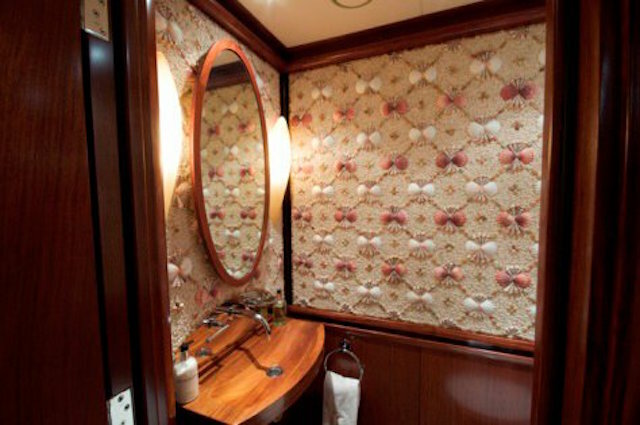 Splashes of color are incorporated in the hand carved floral inlay carpet and fine upholstery, which is a contrast against the neutral walls. 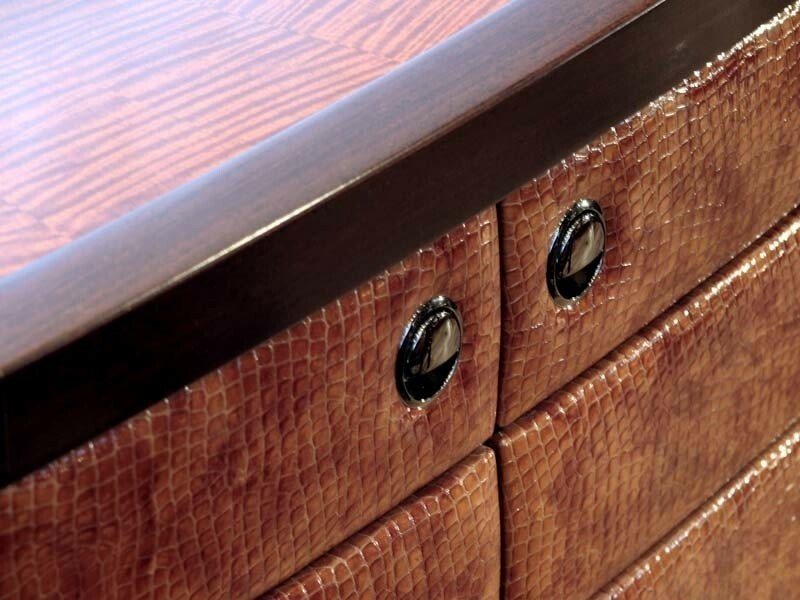 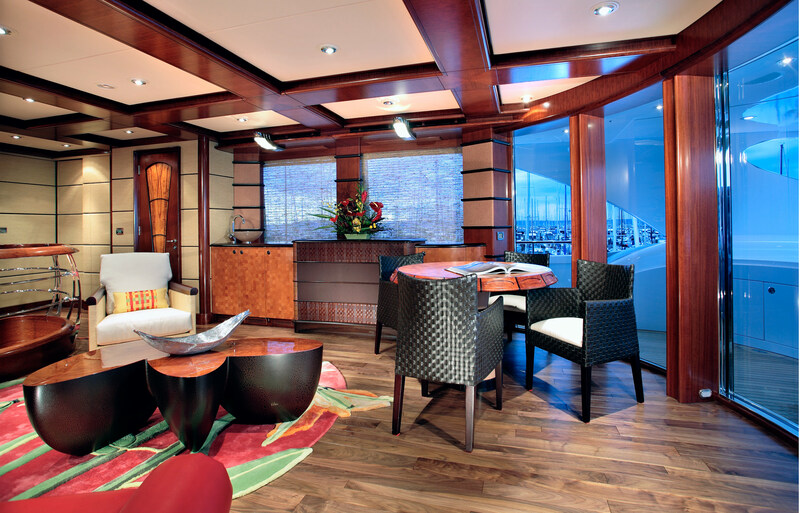 Bamboo, woven woods, leather hides and textured fabrics are some of the fine materials integrated into the interior design. 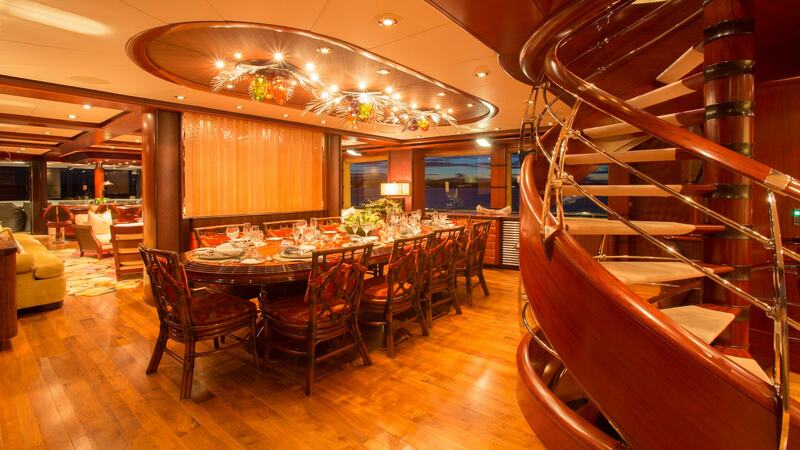 One hallmark of USHER the elegant woodwork that spans the interior spaces, from the African walnut flooring to the bubinga ceiling beams. 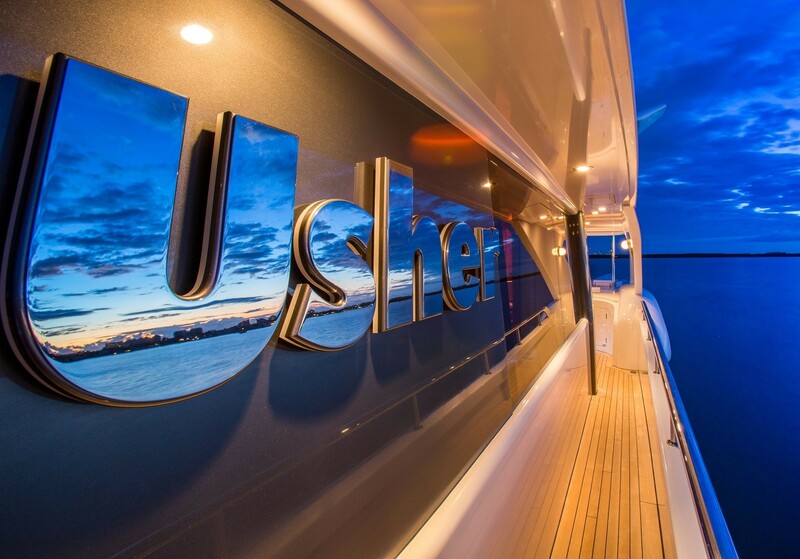 USHER’s exterior is spacious with several entertaining areas. 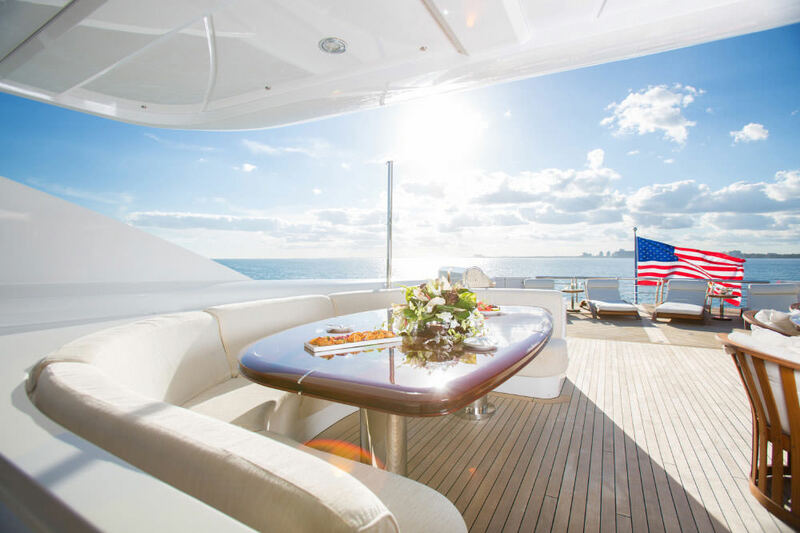 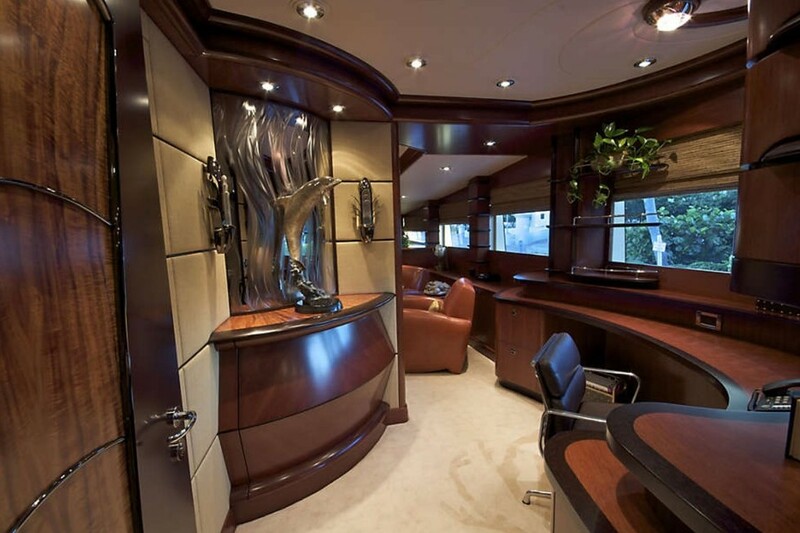 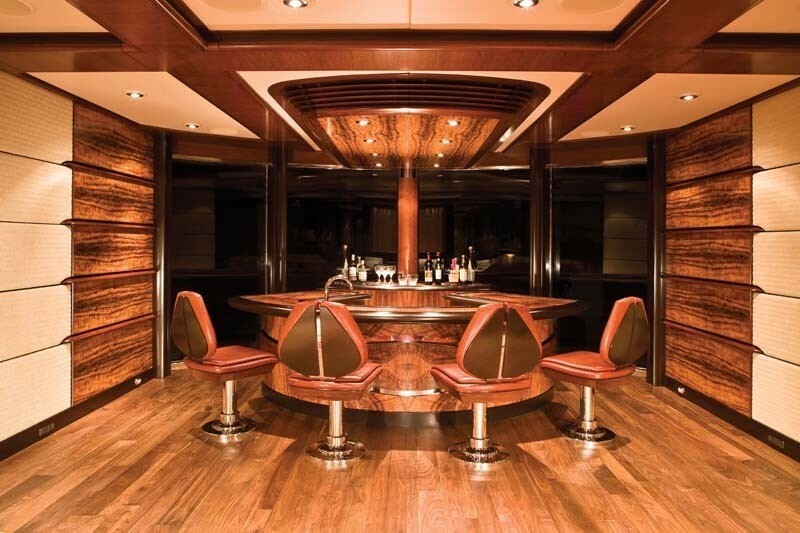 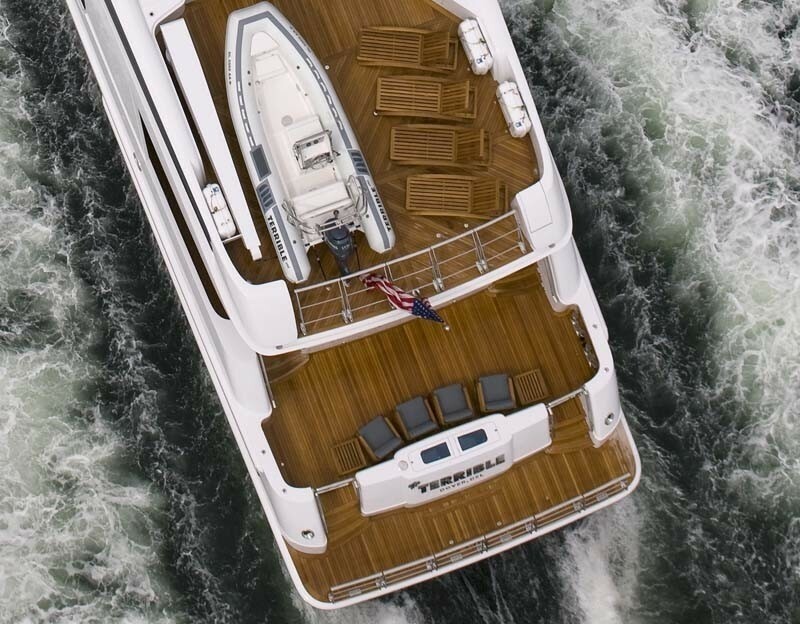 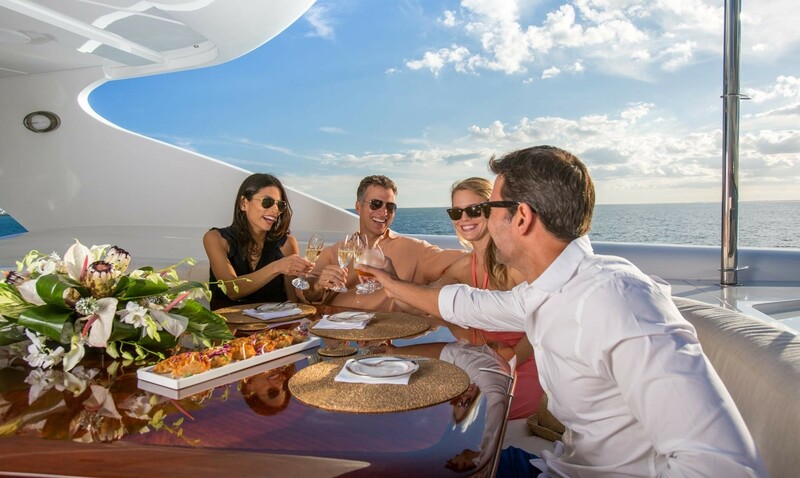 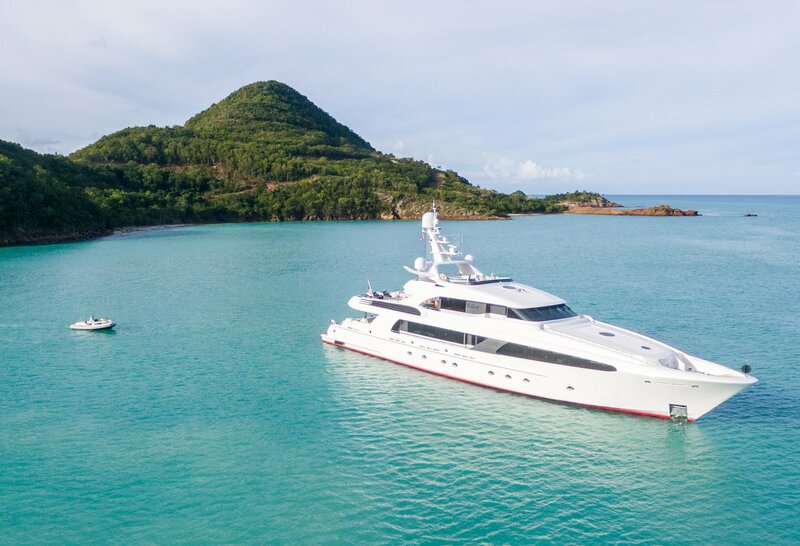 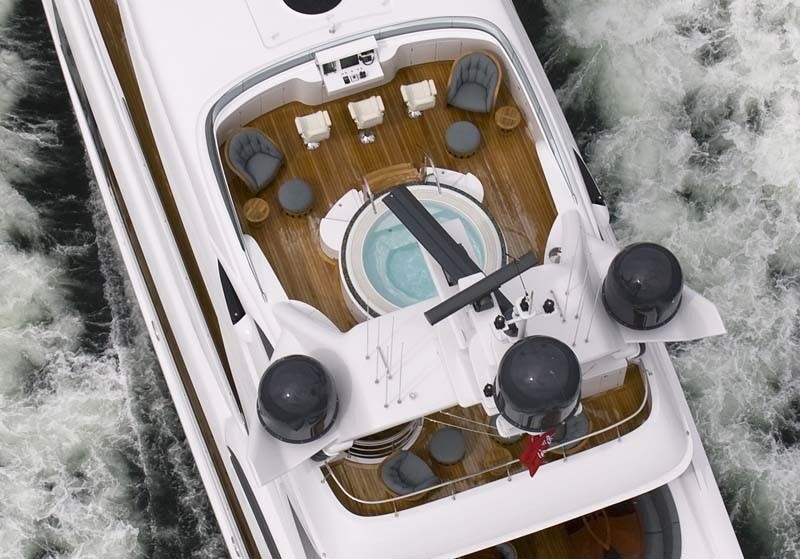 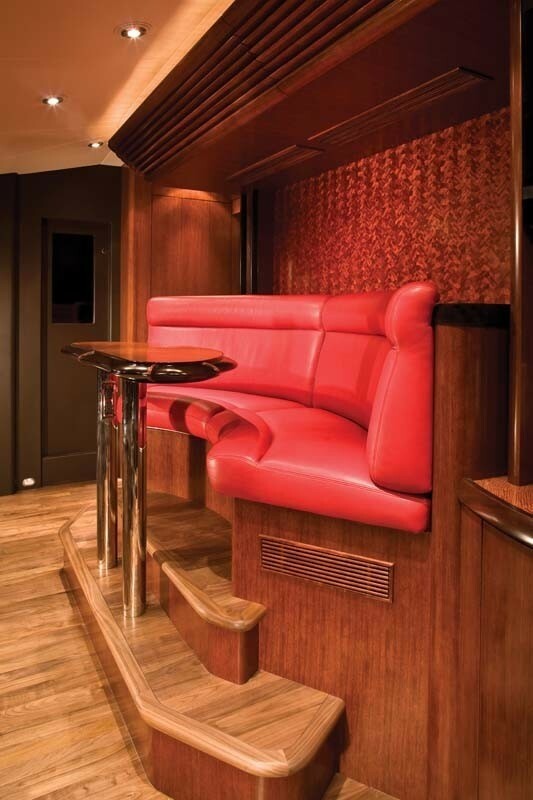 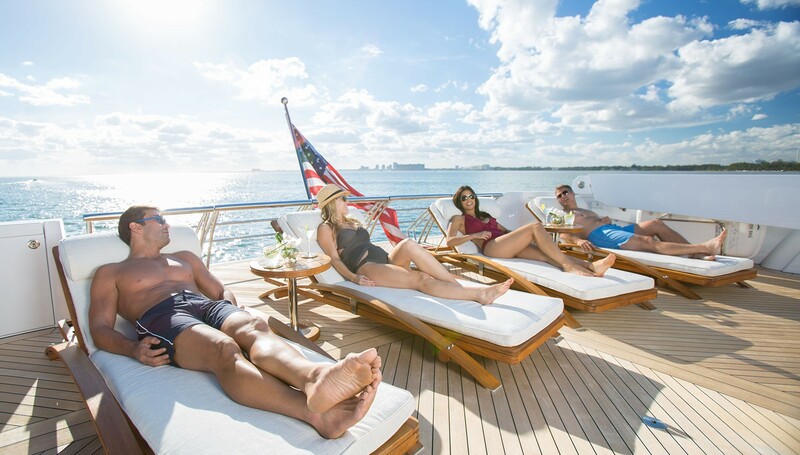 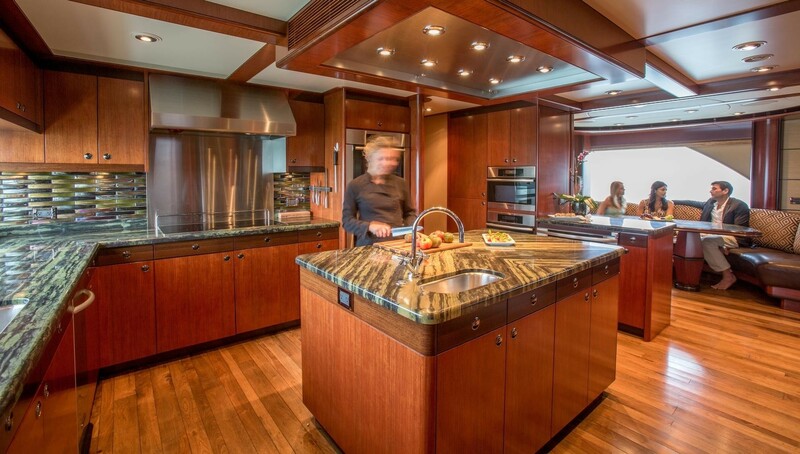 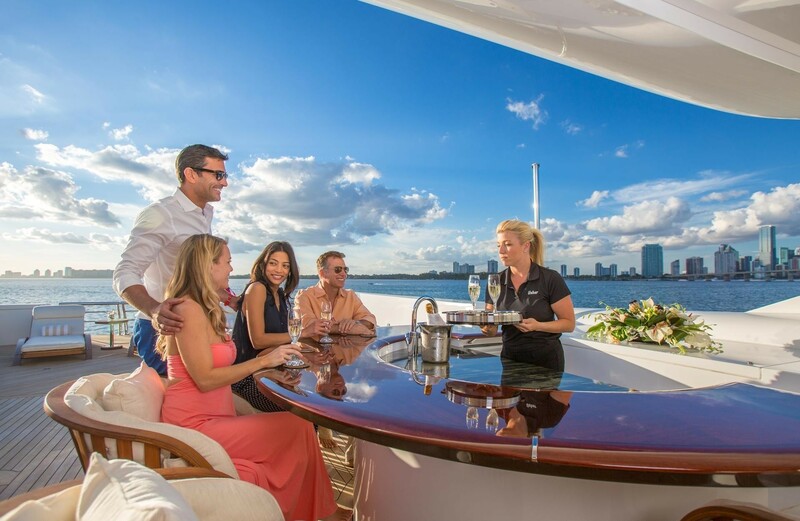 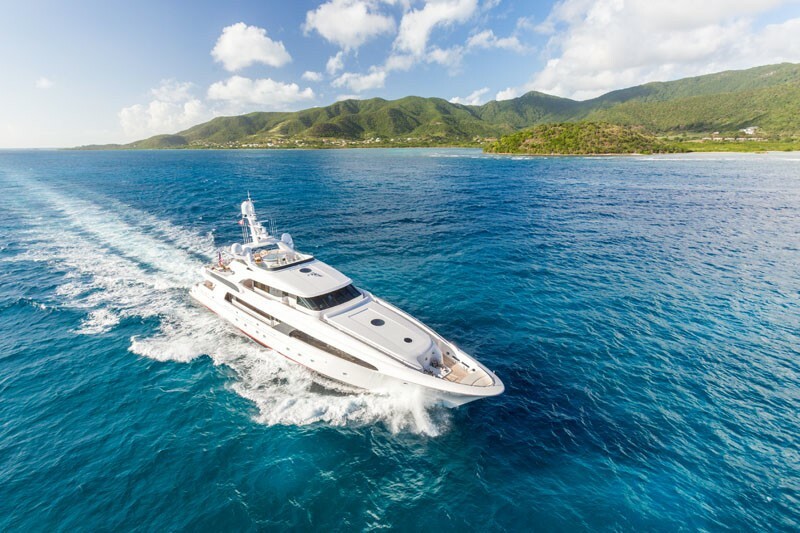 The flybridge, which features a full steering station, is a favourite hangout with a hot tub, wet bar and one of two onboard margarita machines. 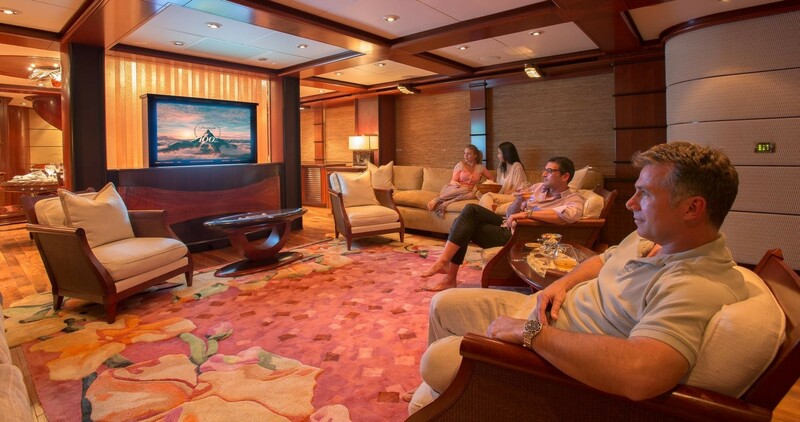 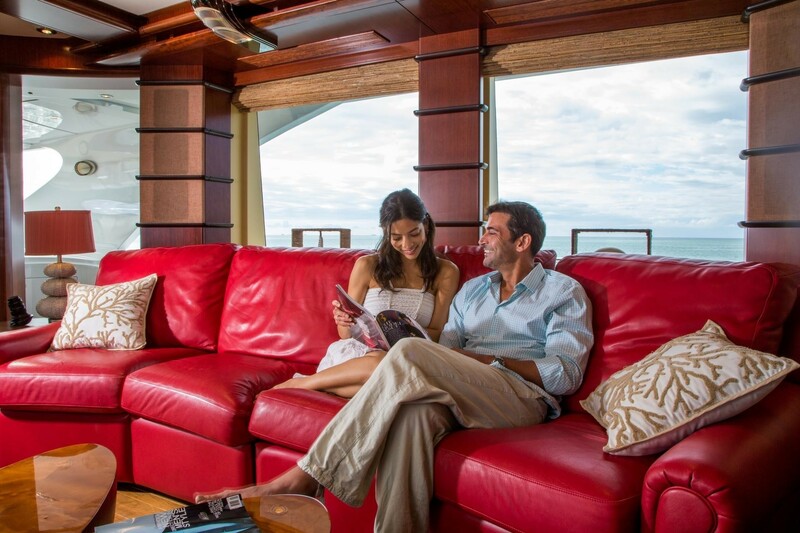 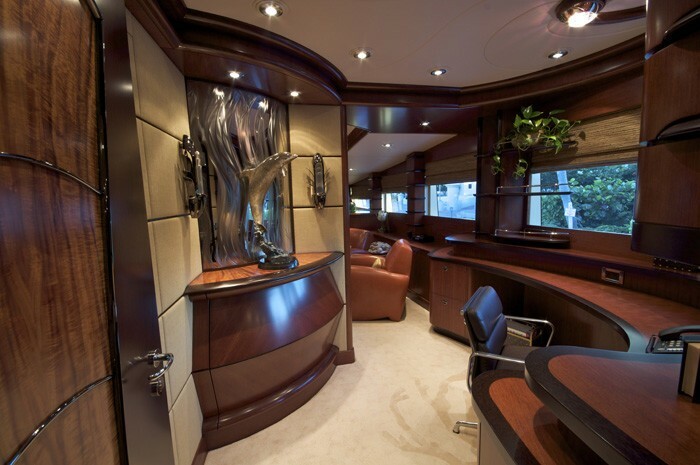 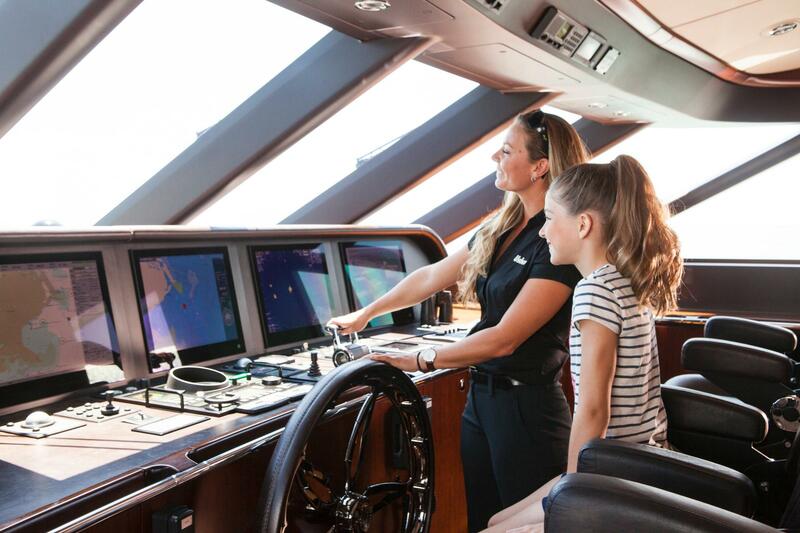 The flybridge also boasts a convenient retractable 50-inch plasma screen television and floating wireless remote. 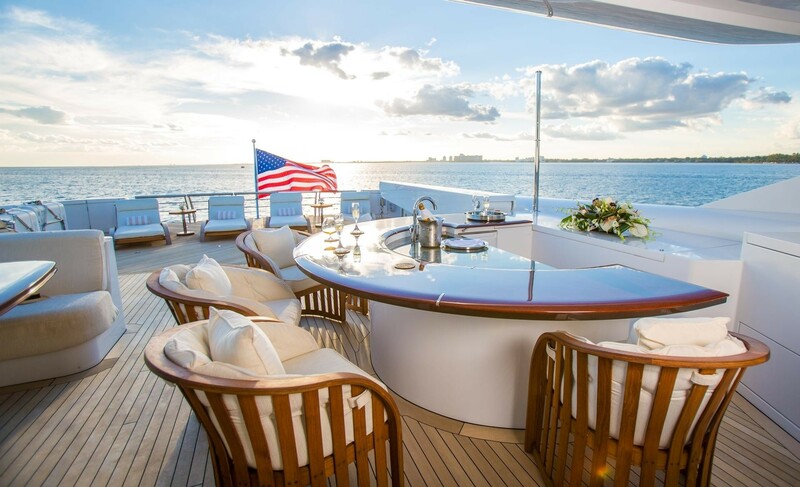 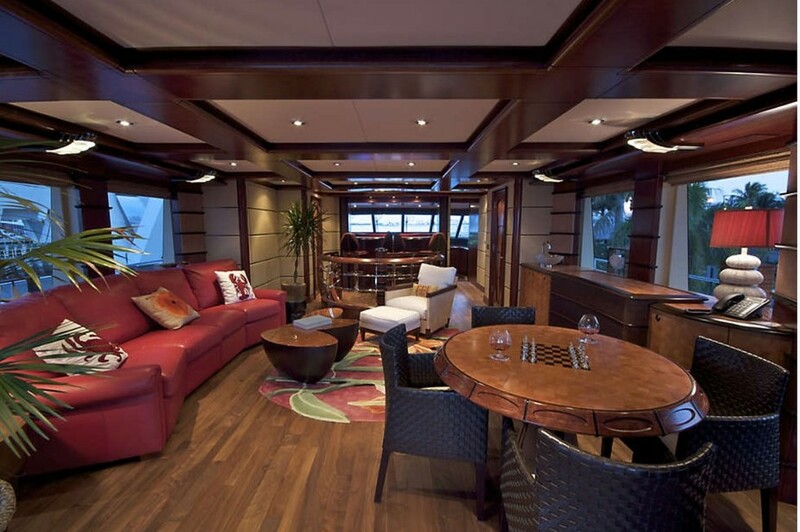 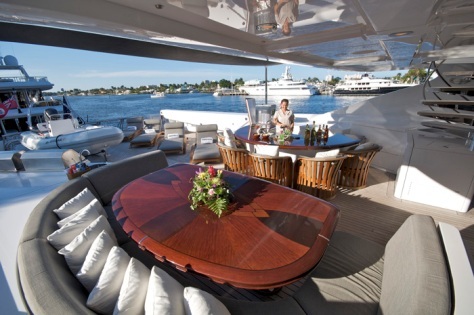 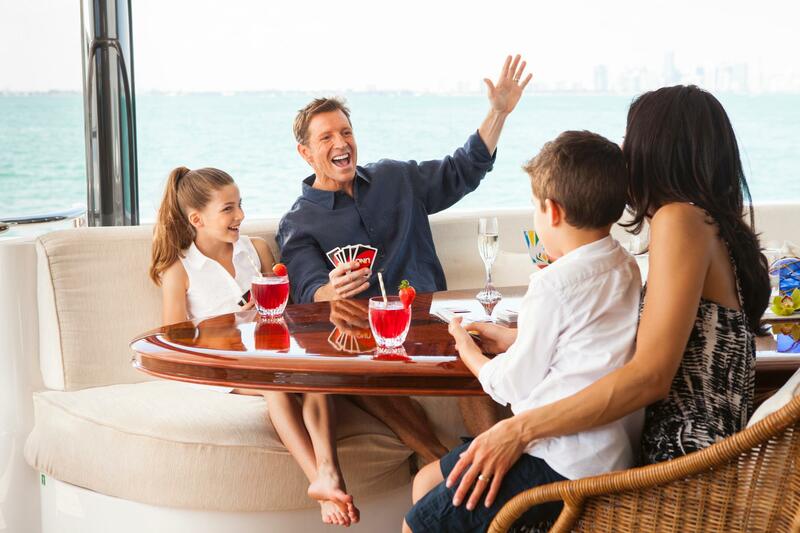 The aft deck features a large bubinga and wenge table with wicker chairs, the perfect setting for alfresco dining. 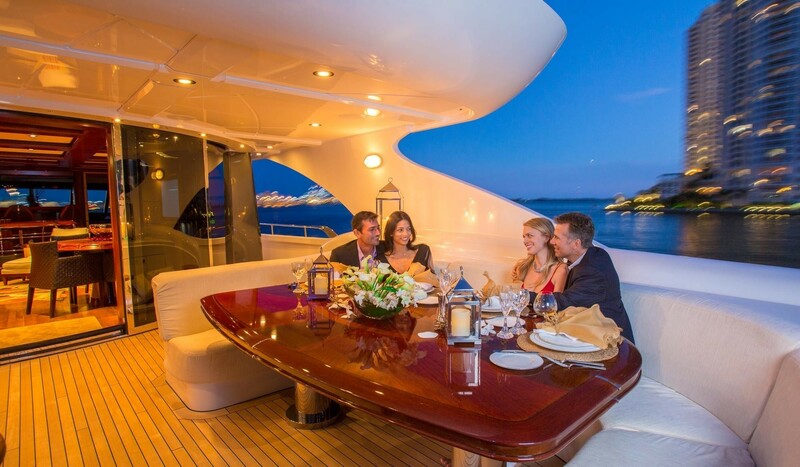 Infrared heat panels offer warmth if needed during evenings spent under the starry skies. 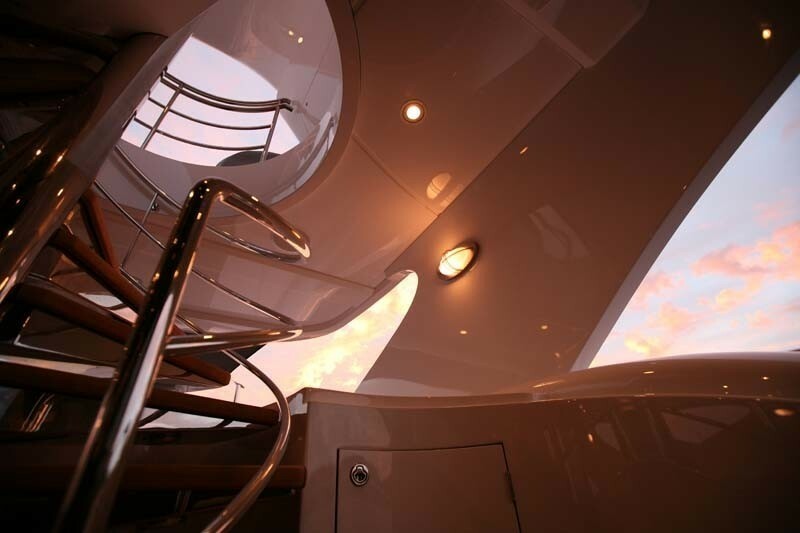 The striking exterior profile features dramatic lines, smoked glass, and a sleek silhouette. 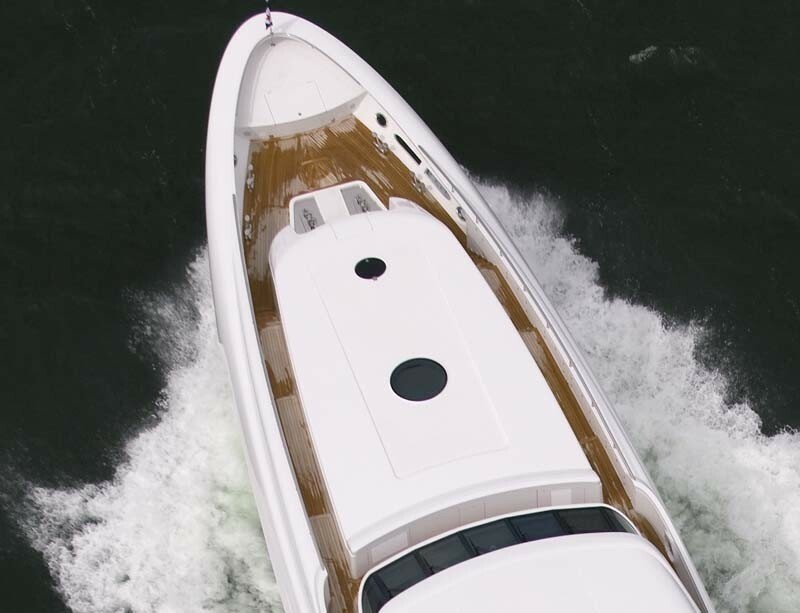 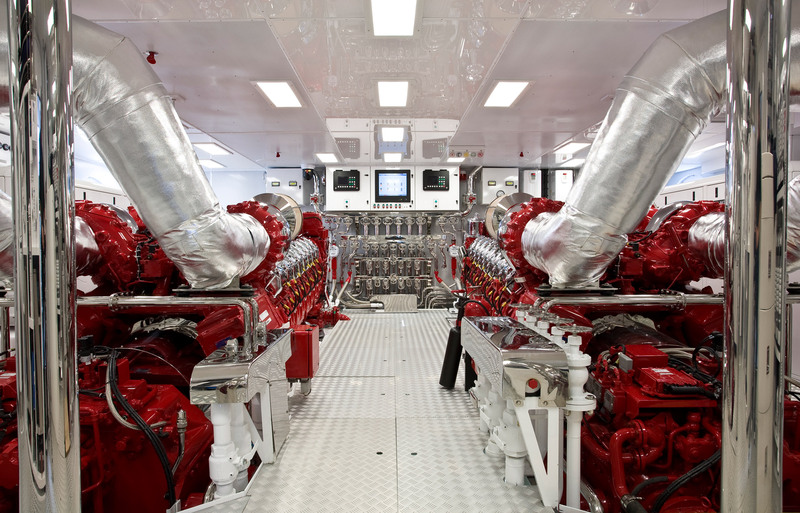 Her twin MTU 16v4000 engines with 3,650 horsepower each enable the yacht to reach a cruising speed of 20 knots with a top speed of 23 knots. 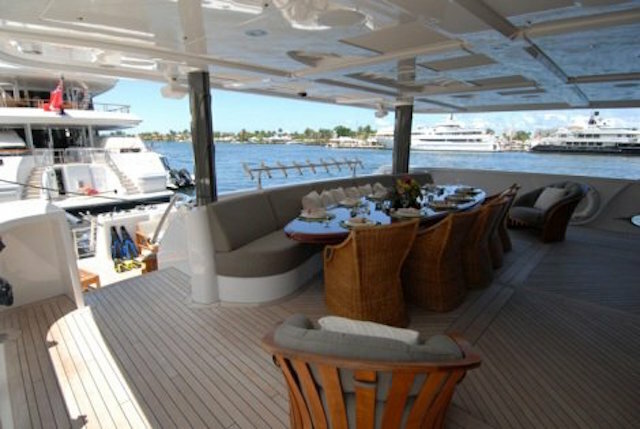 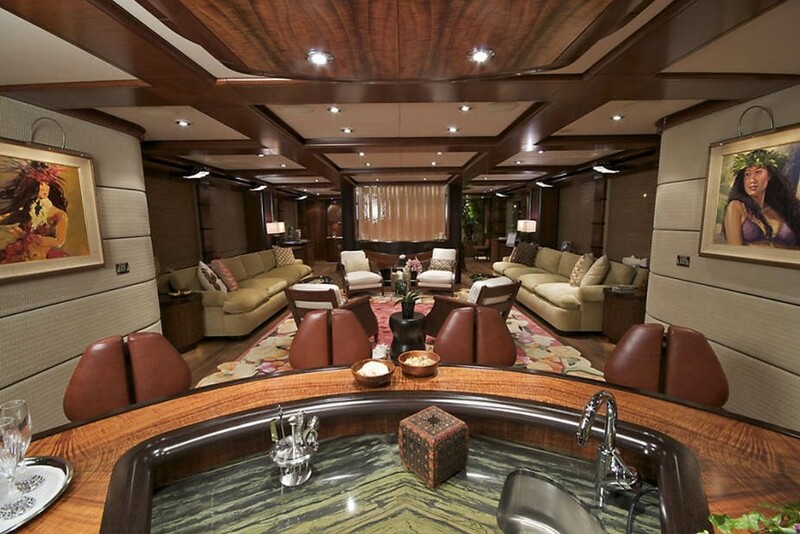 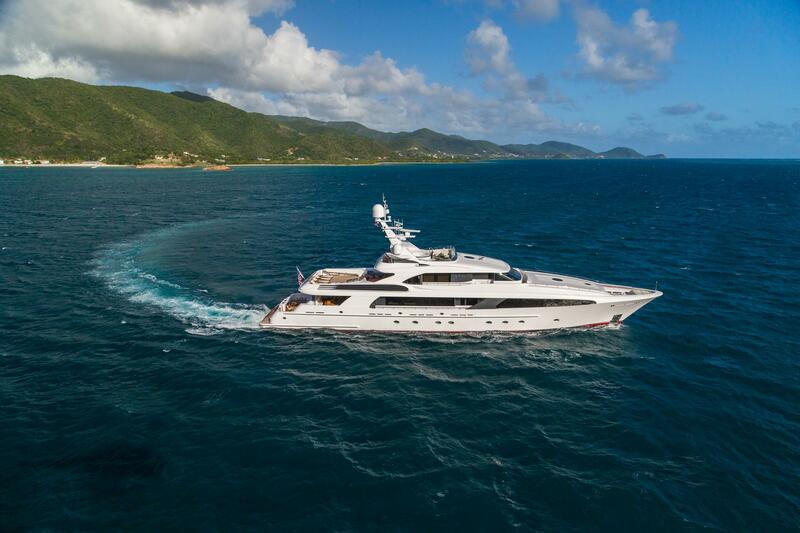 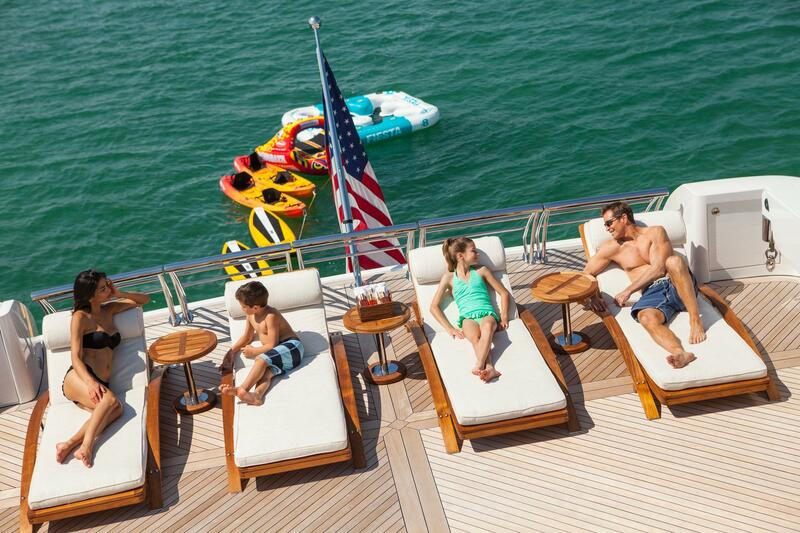 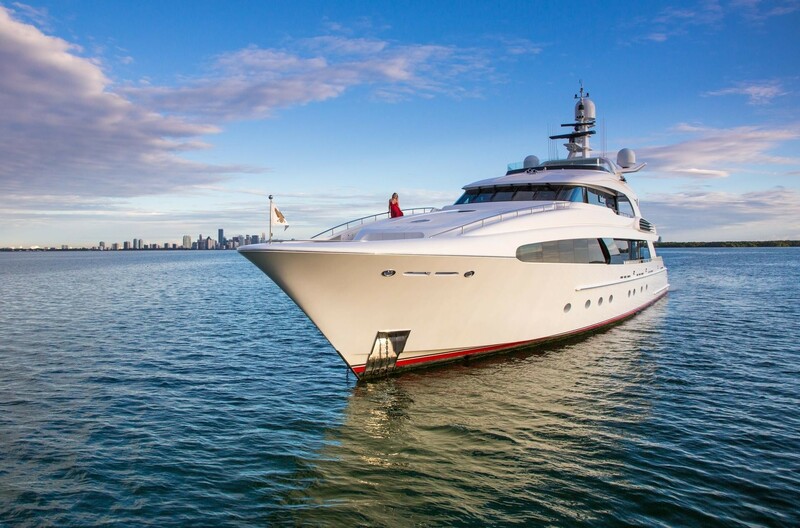 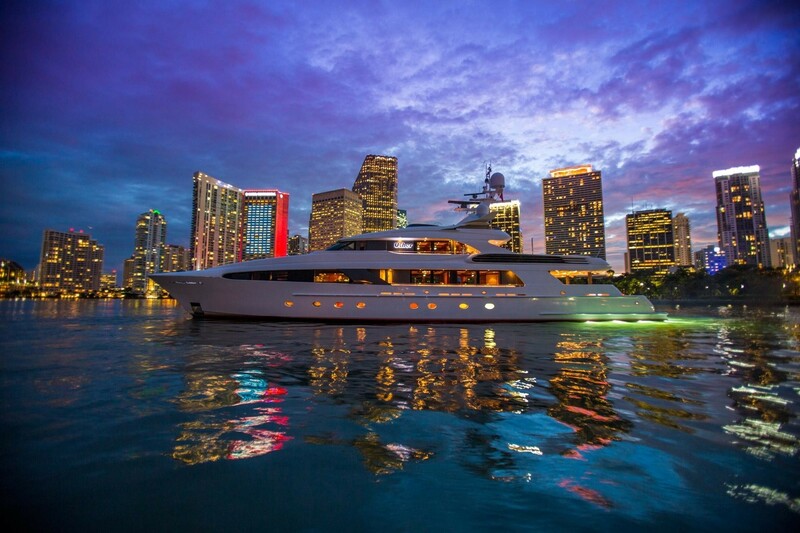 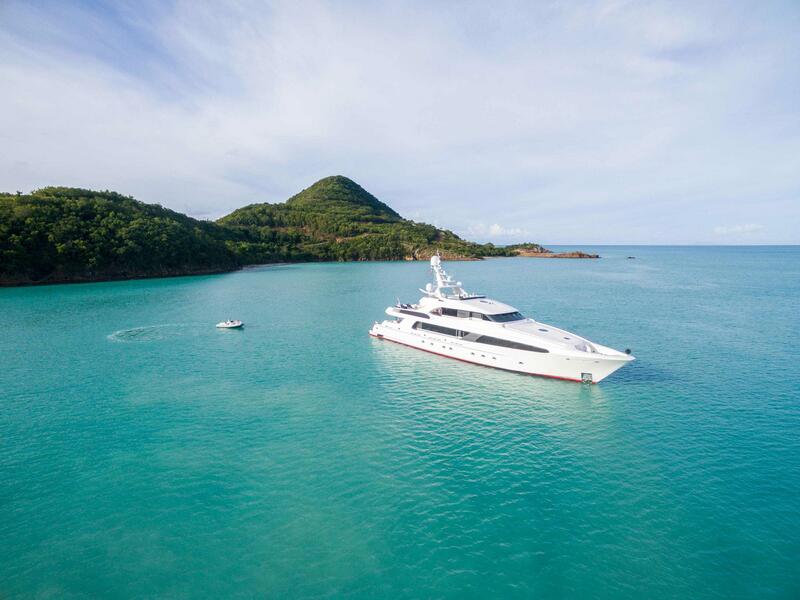 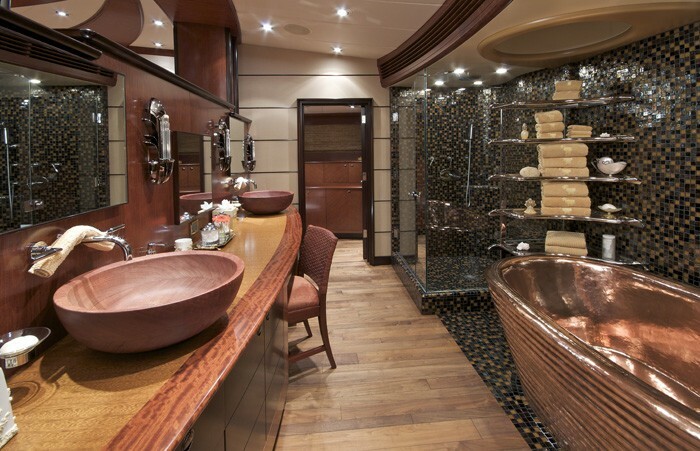 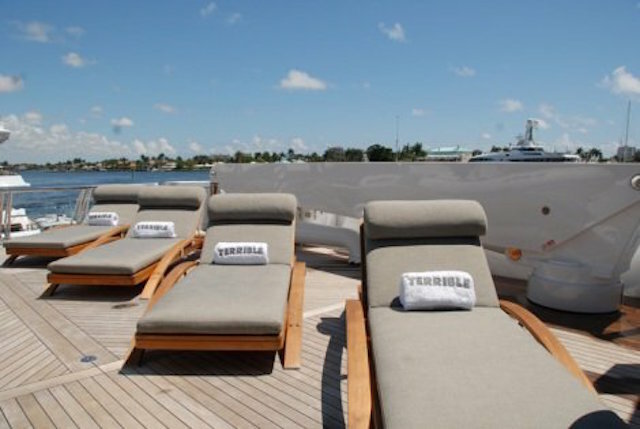 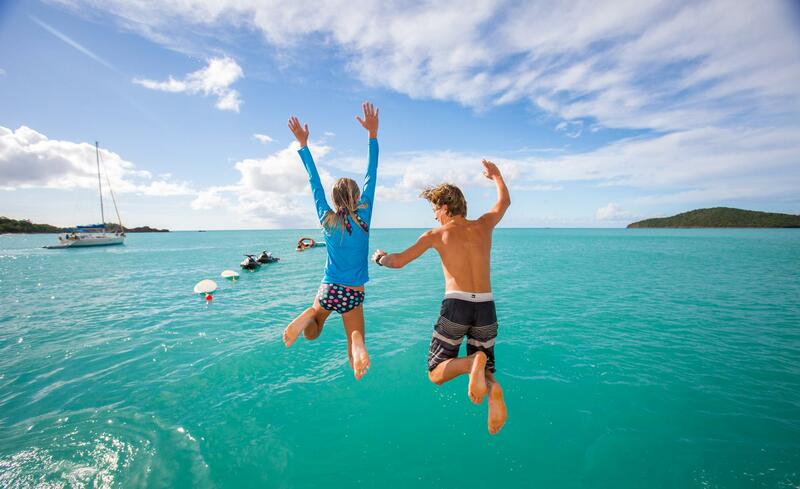 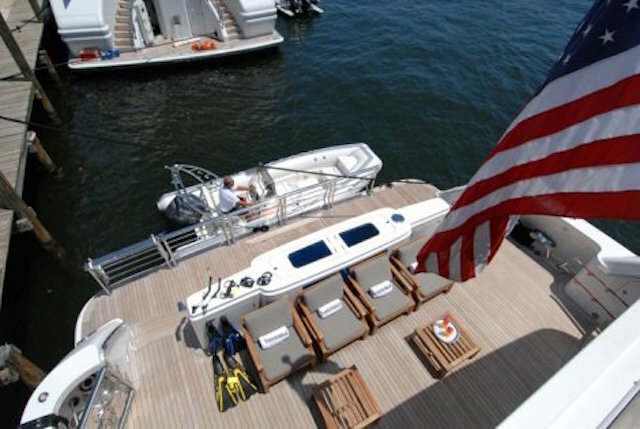 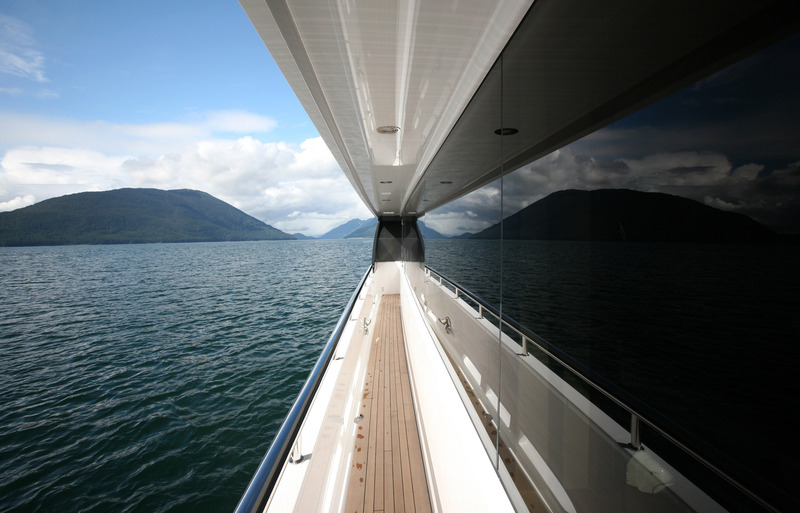 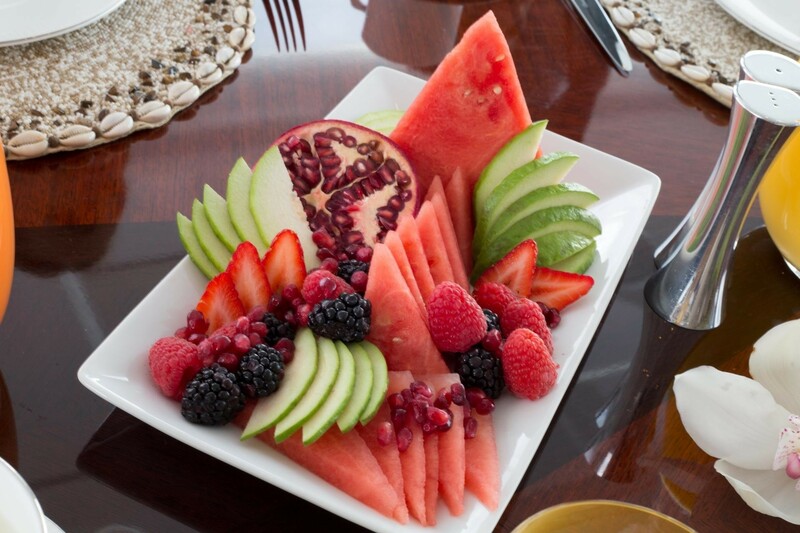 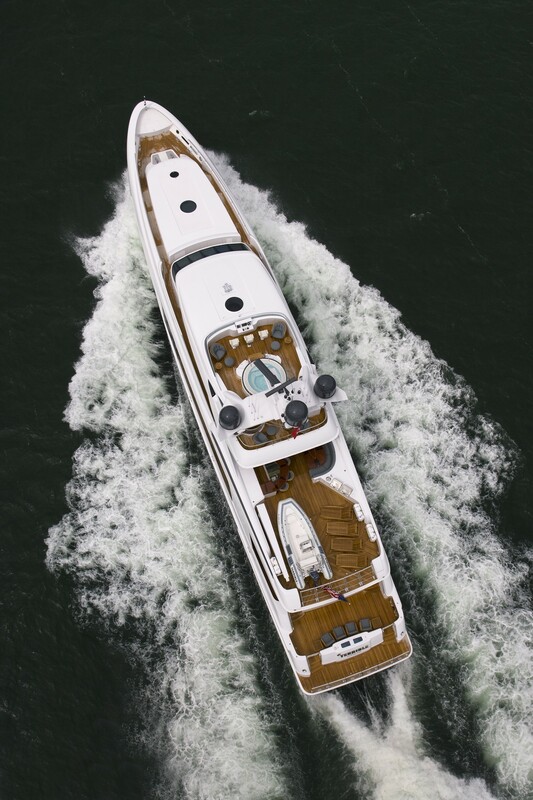 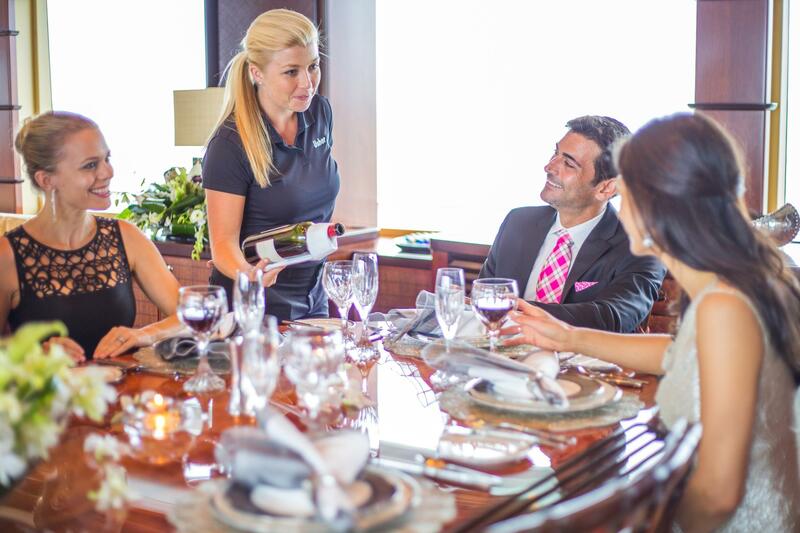 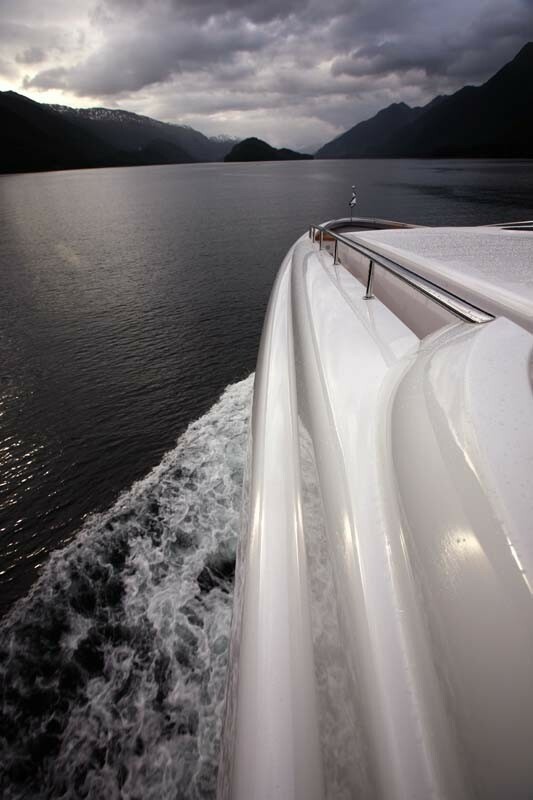 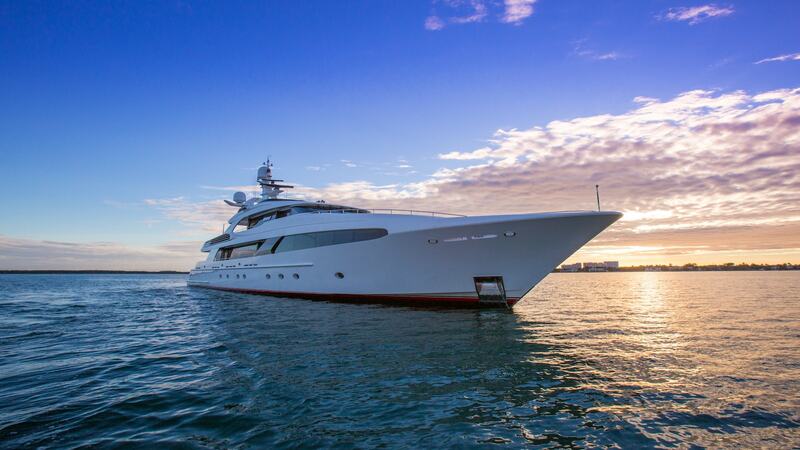 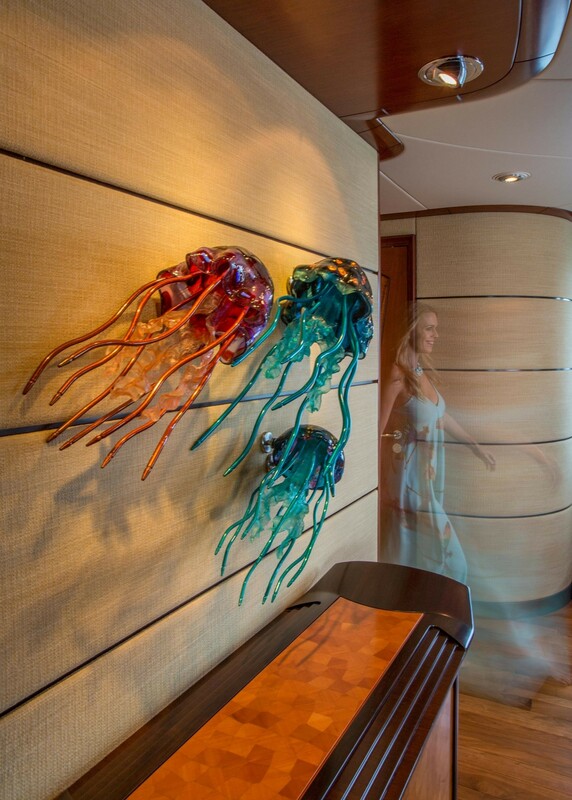 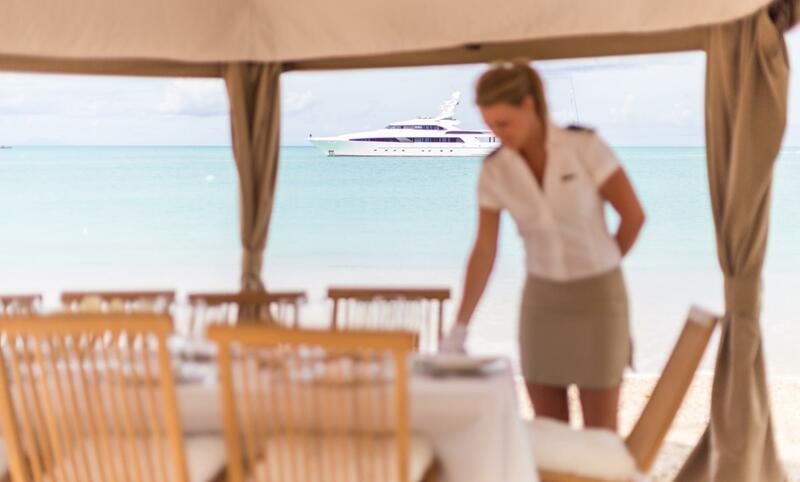 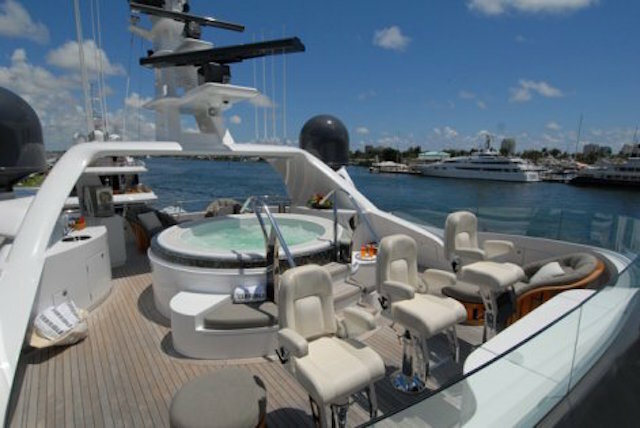 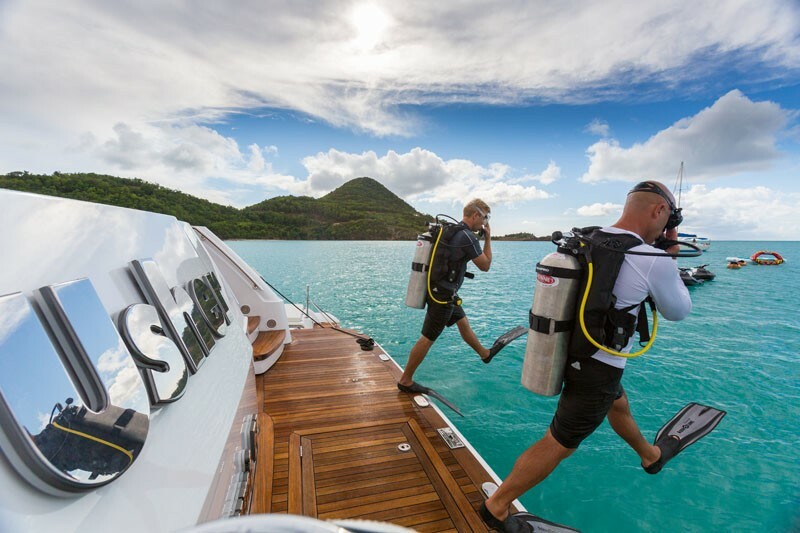 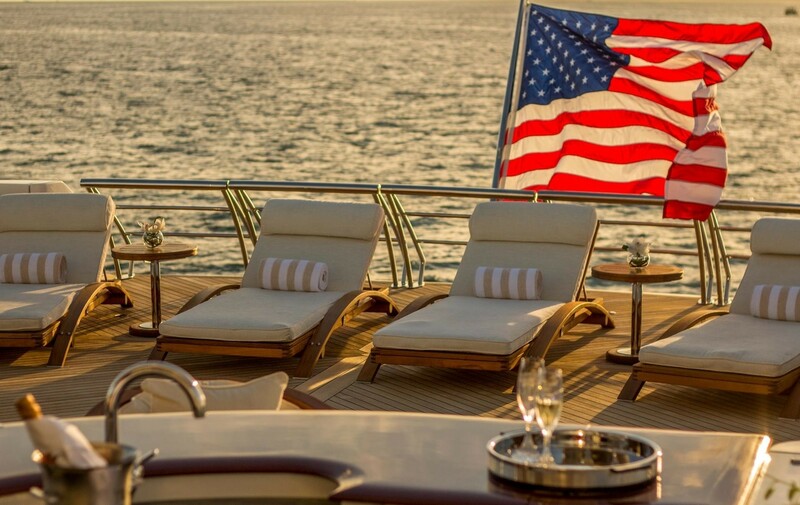 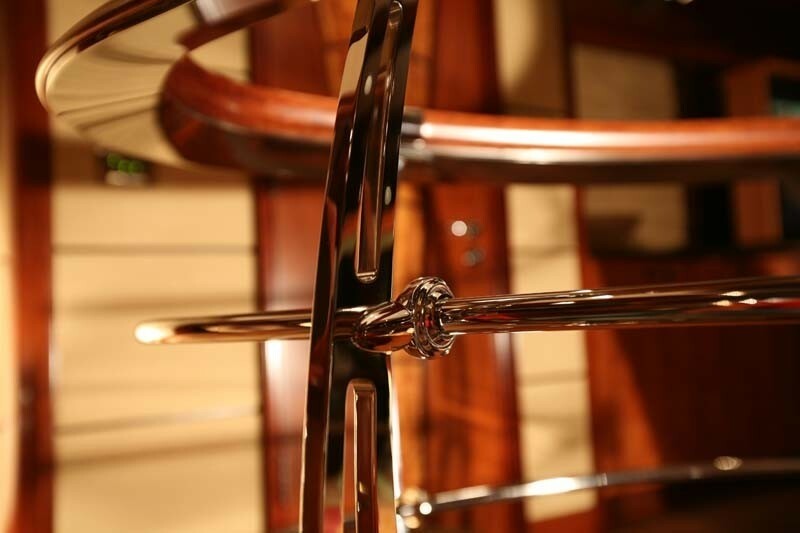 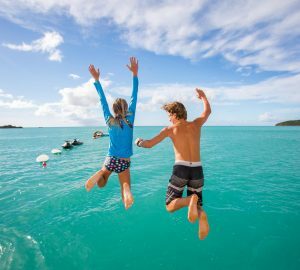 Motor yacht USHER has a fantastic selection of water toys for charter guests to enjoy. 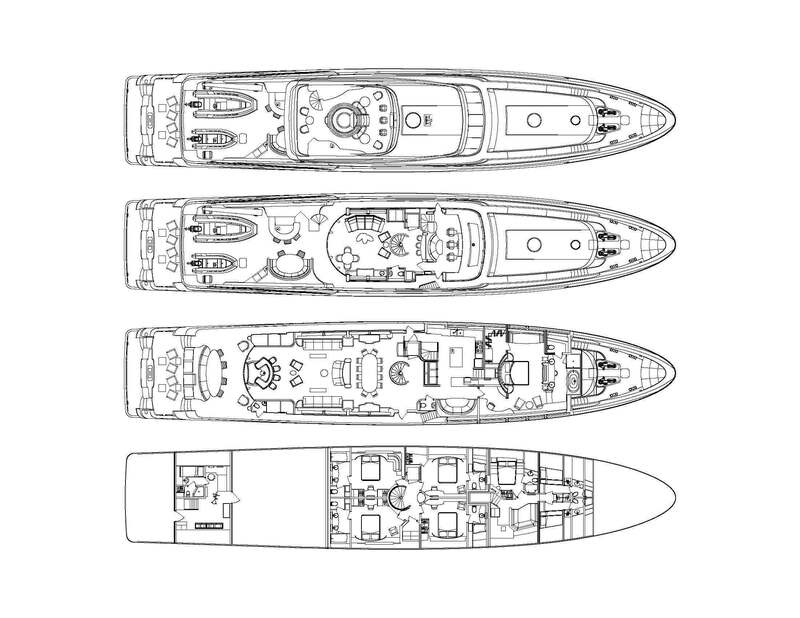 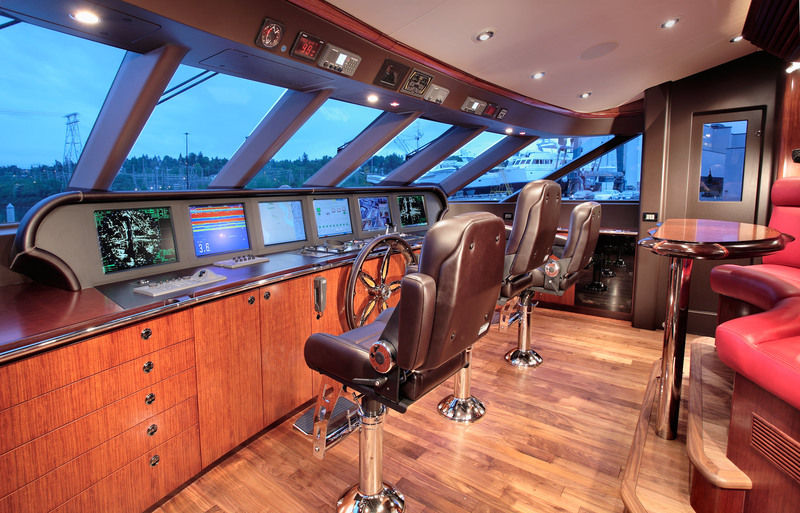 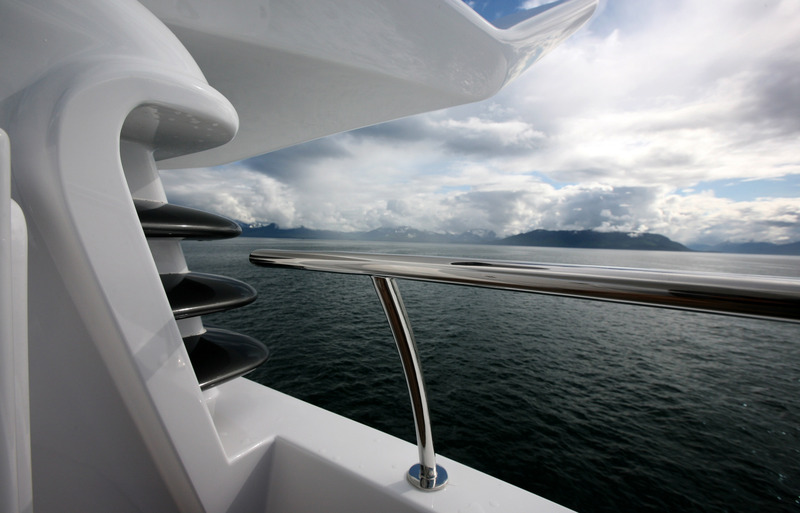 Added amenities include an elevator, stabilizers at anchor, and VSAT constant wireless internet. 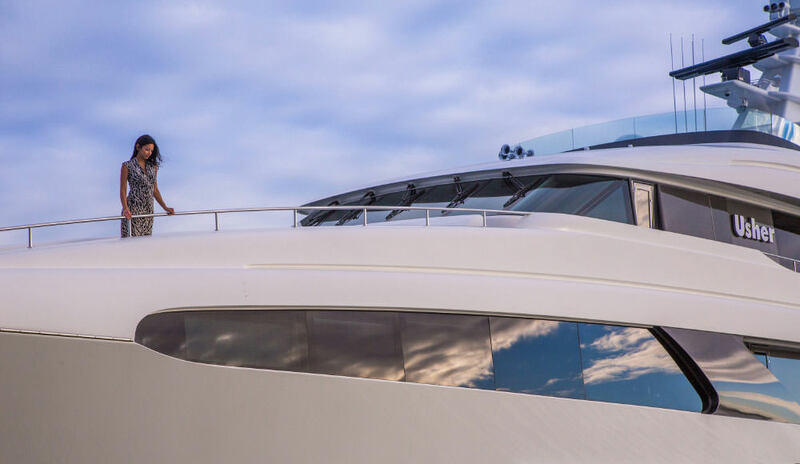 Built entirely of composite materials, she is a lightweight yacht that is strong, durable and performs to its expectations. 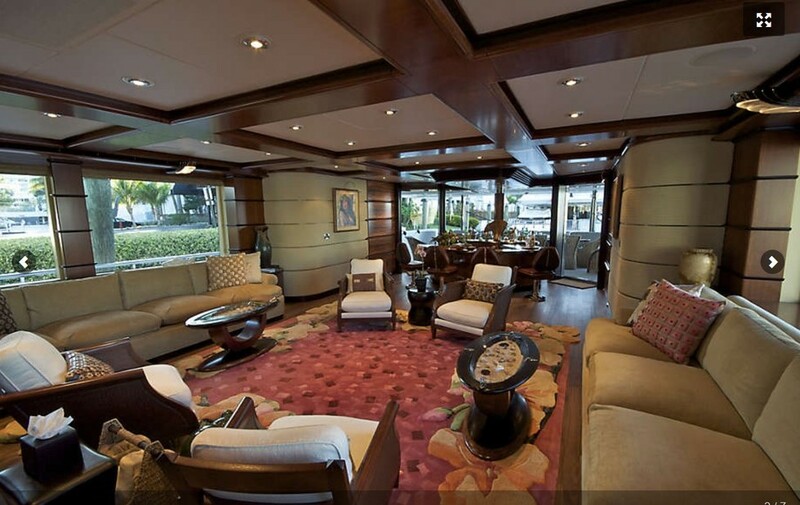 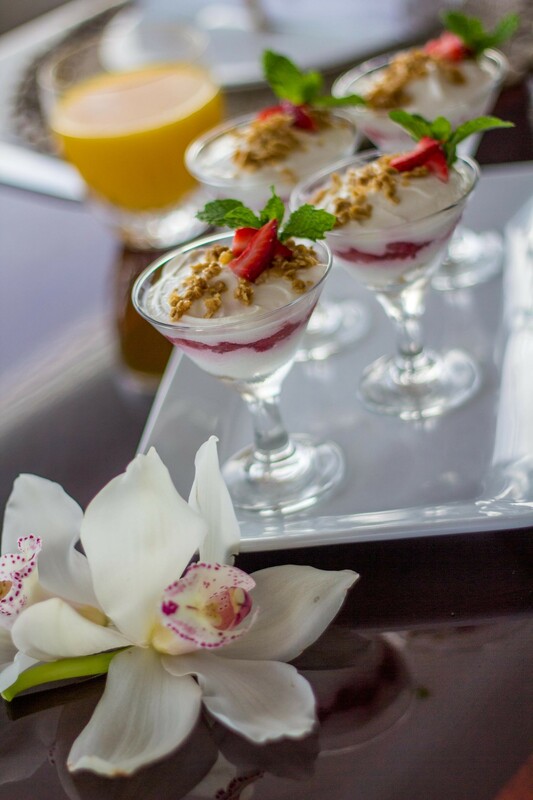 USHER can accommodate up to 12 guests in 5 sumptuous suites. 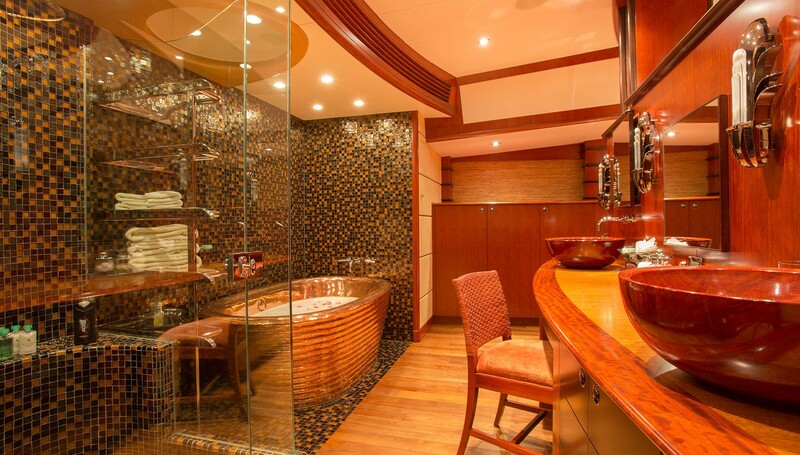 The master suite is an intimate and private oasis with rich textured tropical woodwork. 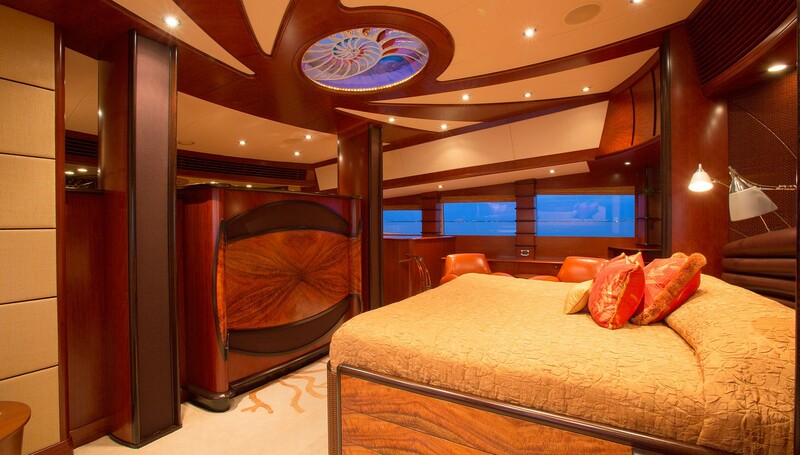 Above the king sized bed, is a beautiful nautical-inspired stained glass featuring offering a natural brightness to the suite that can be screened at the touch of a button. 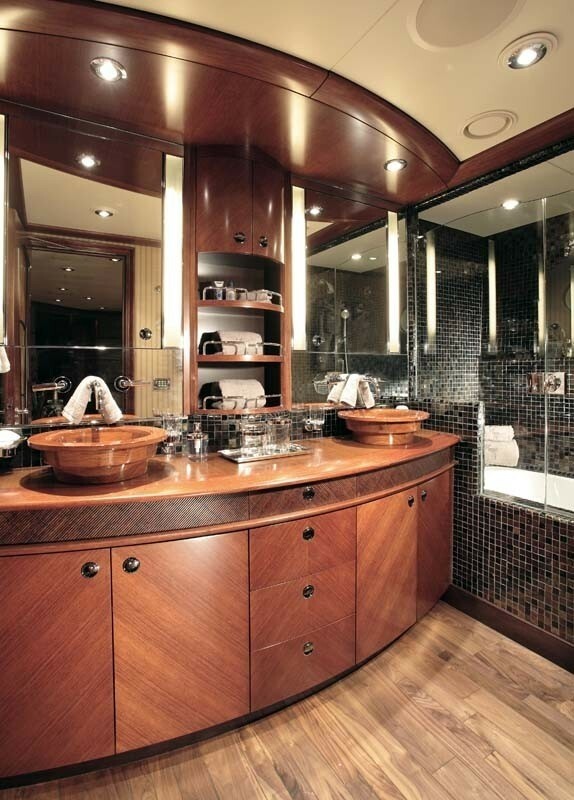 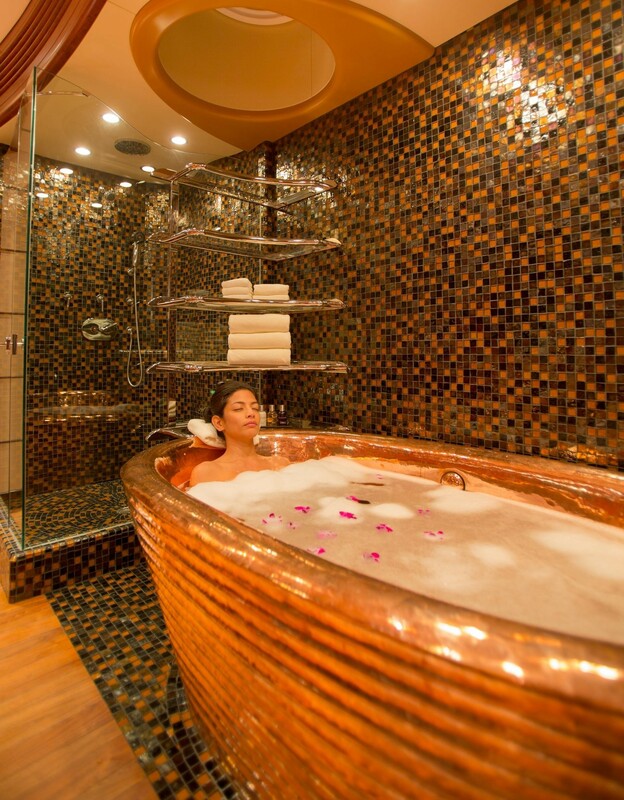 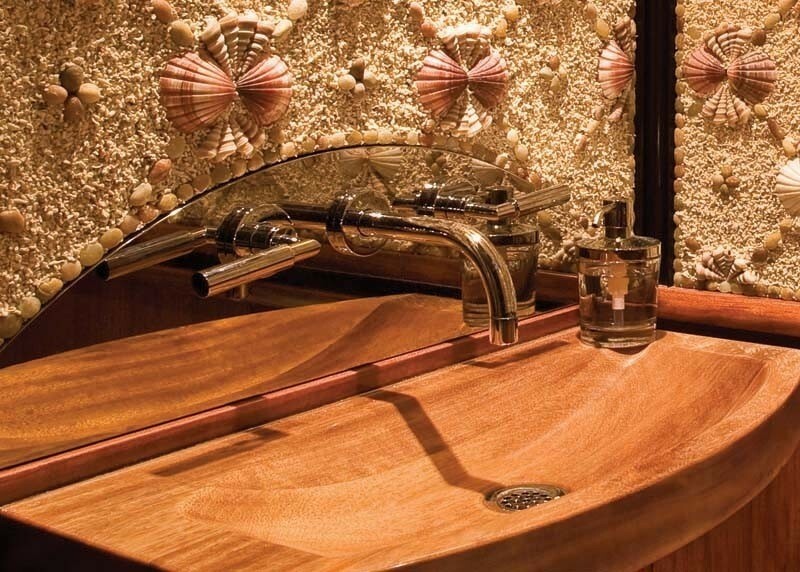 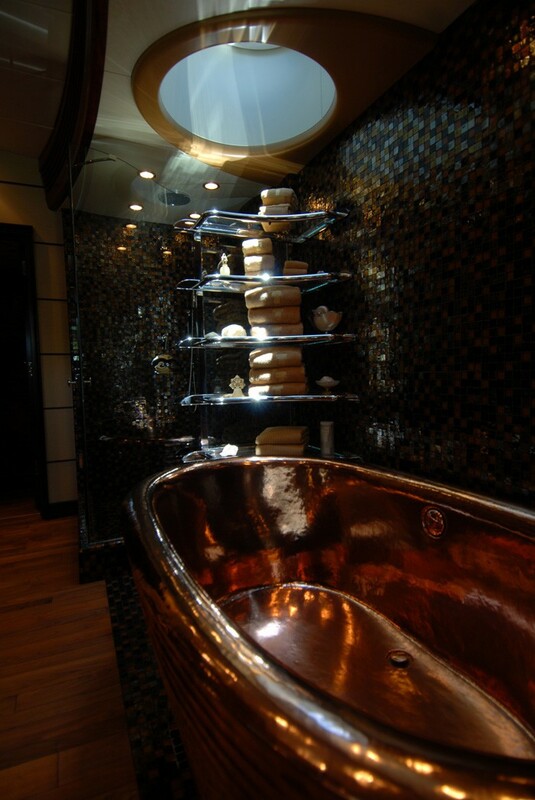 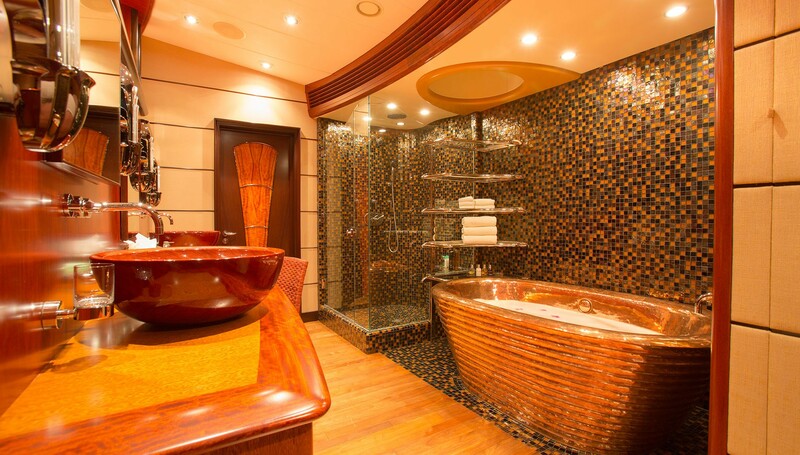 The Master Ensuite features bronze and black glass mosaic tiles, wood basin sinks and an opulent copper soaking tub. 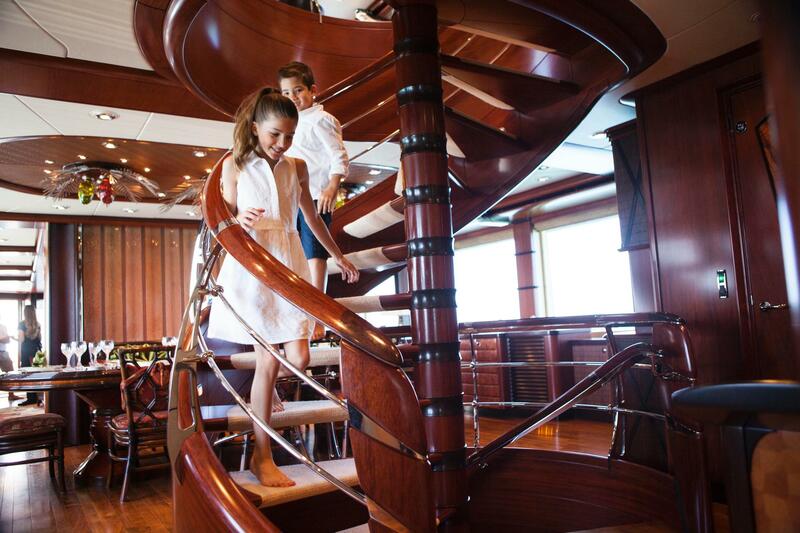 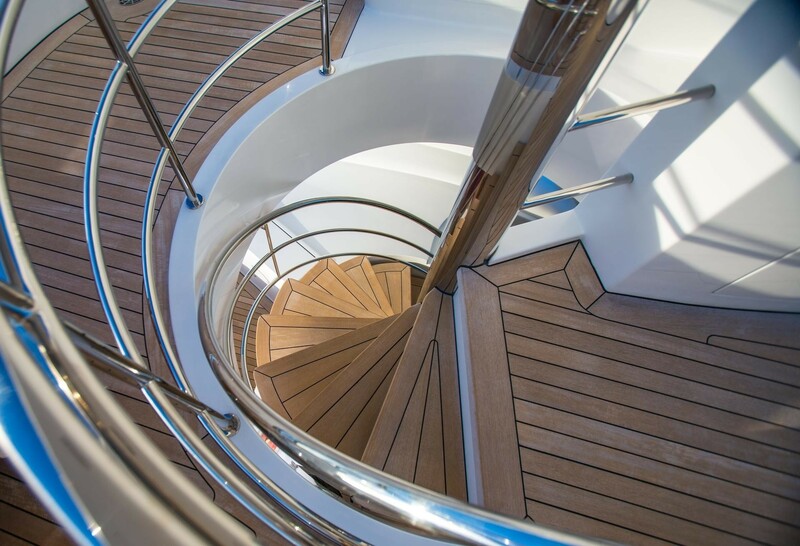 The remaining cabins are located on the lower deck accessed via the spiral staircase. 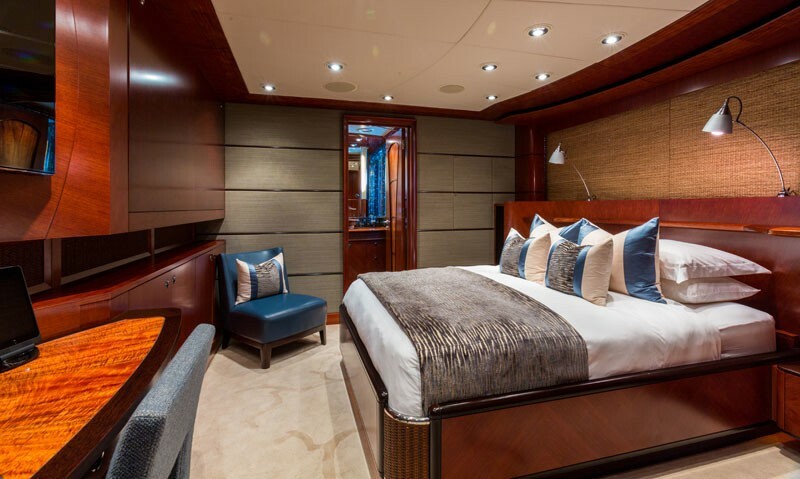 Each cabin shares the same design scheme that prevails throughout MR TERRIBLE’s interior, finished in four separate color palettes. 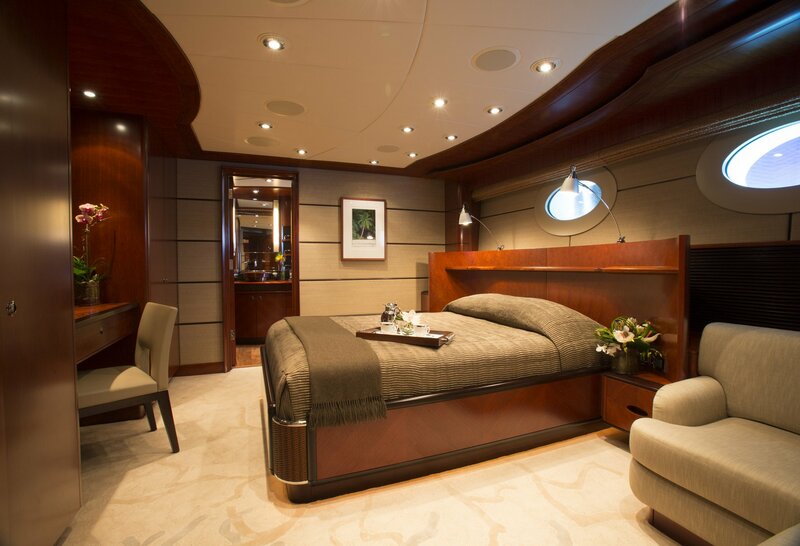 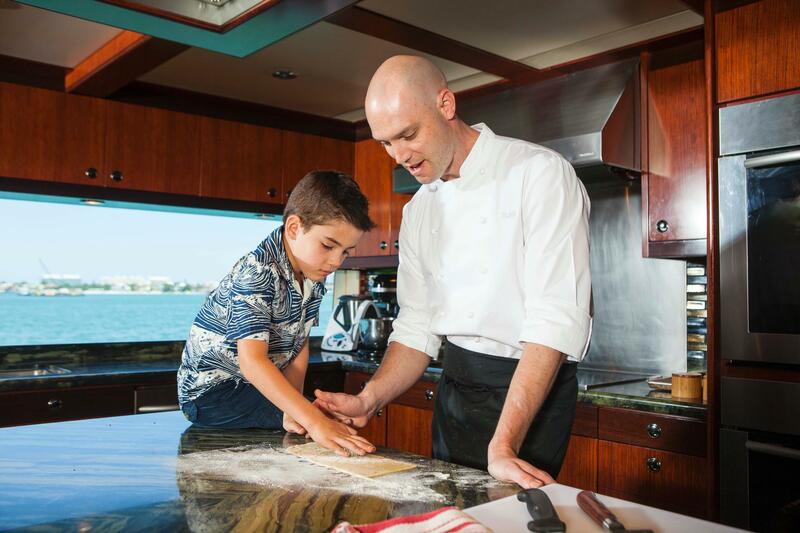 The staterooms are equipped with Pullman berths for children and the two VIP suites include a settee.